Welcome Back. 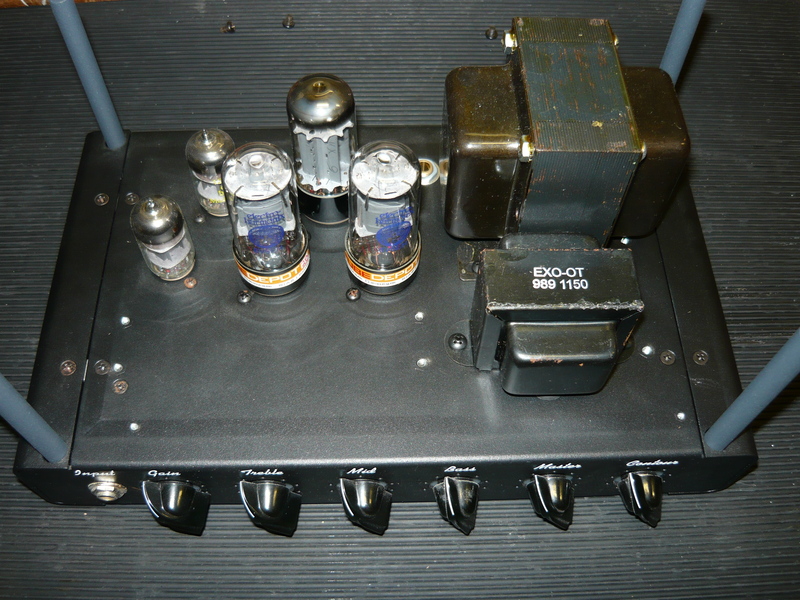 This blog showcases once again the Expressionist Series amplifier, designed and built by the Richards Amplifier Company – Australia. 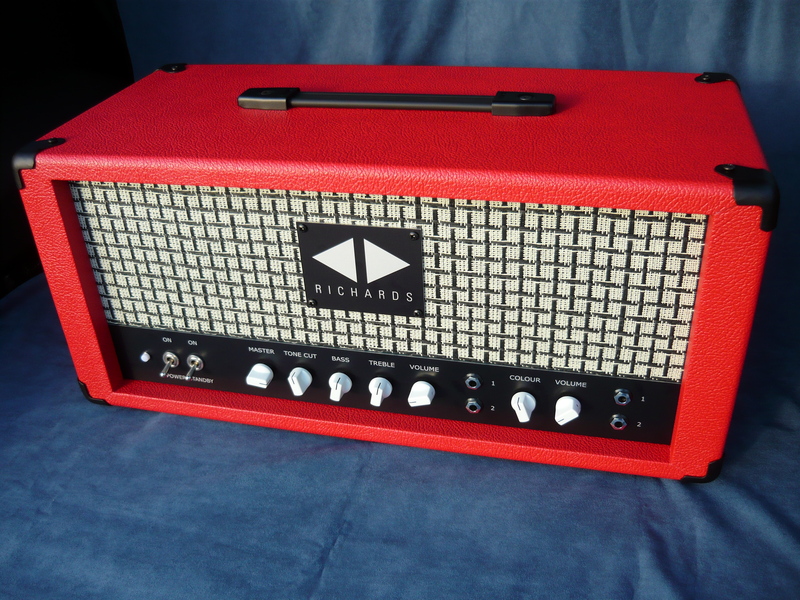 This latest example is a custom order for Sydney-based guitarist Jonothan Holmes, in stunning vintage red tolex covering, with a contrasting ‘checkerboard’ front grille cloth. 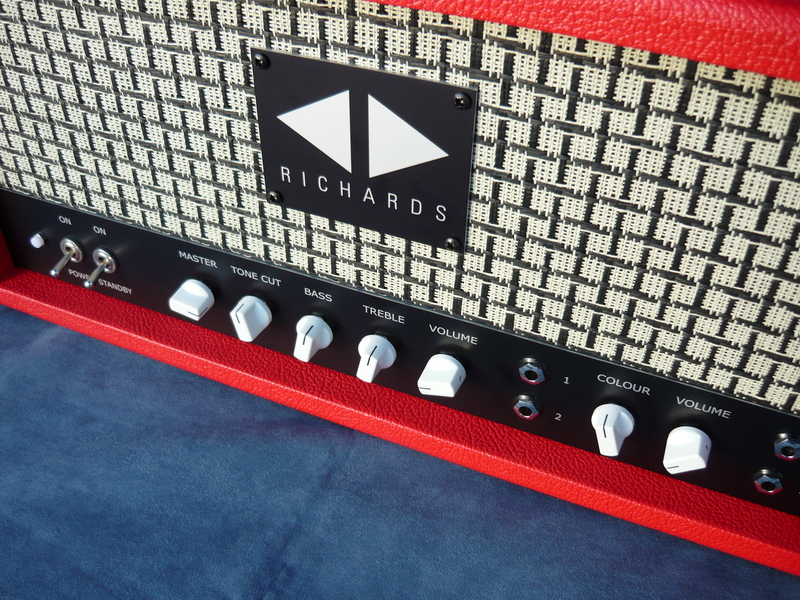 We previously presented the Expressionist amp in blogs dated 01May2012, 24July2011 & 10July2011, including photographs and a testimonial written by Aria Award winning producer, Jonathan Burnside. We have been building the Expressionist models for well over 10 years now, with 15 watts currently the most popular power rating. The Studio Expressionist option, as pictured in this blog, enables the user to select either the standard (for this model) EL84/6BQ5 output valves or the alternative 6V6GT output valves, offering the broadest possible range of tones for your recording projects. The EL84 output valves, which are employed throughout the Expressionist Series amps, are famous for their chimey tops, complex midrange and lively dynamic response. By contrast, the 6V6 output valves are noted for sounding smooth and sweet, ie they were the valves typically used in the smaller Gibson and Fender amps back in the day. This is actually the first time we have employed the new Mullard (reissue) 6V6GT valves, as well as the new Tung Sol (reissue) GZ34/5AR4 rectifier valve. EL84/6BQ5 valves by JJ, Electro-Harmonix and Tung Sol (reissue) have all proved themselves to be reliable performers in cathode-bias/Class-A amplifiers in the 15 to 30 watts range. The intention of the Expressionist Series model is to offer the classic vintage Brit tones from 1959 to 1965, and well beyond. The preamp offers two discrete channels, ie each channel has it’s own unique signal path and equalisation. There is no shared circuitry until the two preamp signals are combined in the phase inverter stage of the power amplifier. The two channels are mixed together in such a way that they are back in phase with each other, conveniently enabling the channels to be patched together in the traditional way, or combined with an A/B/Y pedal (supplied with each Expressionist). Channel 1 is built around the EF86 pentode preamp valve, recently reissued by Tung Sol, but also still available on the n.o.s. market. This channel is voiced with a (relatively) flat midrange response, as opposed to the more usual ‘scooped’ midrange response of iconic valve guitar amp designs since the 1960’s. The deceptively simple 6-way Colour tone switch enables the perfect midrange to low frequency balance for your performance. Here’s our tip: patch CH-1 and CH-2 together for a blend of ‘scooped’ and ‘non-scooped’ EQ – it’s a huge and powerful tone. Always use a short, high-quality jack/jack patch lead for this purpose. 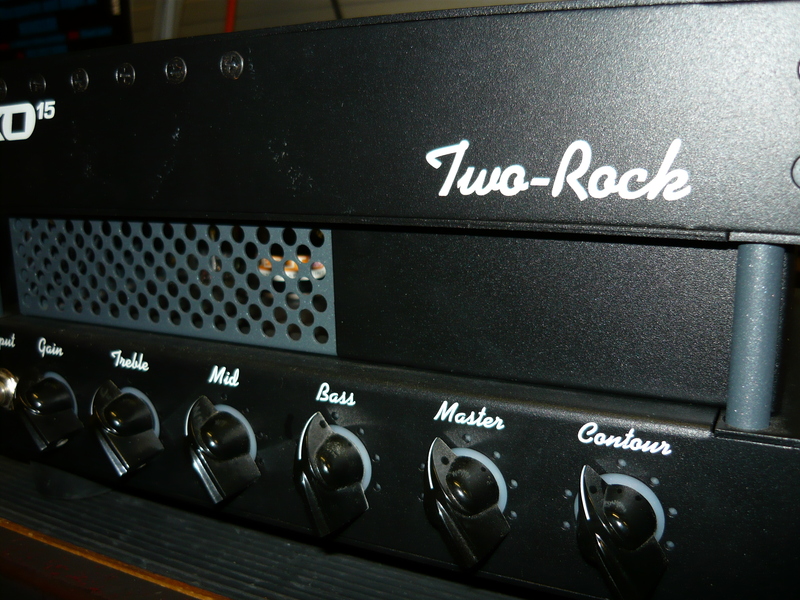 Channel 2 employs a pair of 12AX7/ECC83 twin triode valves to provide two sequential gain stages and a cathode-follower ‘tone stack’ driver stage. Obviously this channel was inspired by the famous ‘top boost’ channel in the mid 1960’s British Invasion amps. We have spent the last decade tweaking this channel to achieve a tonality that equals the very best examples of the vintage era (quite unlike the various ‘reissues’ from the last couple of decades, including both UK and Chinese manufacture). Finally, the power amplifier section has recently been upgraded with an over-spec’d power transformer that runs cool at full power. We have also upgraded the filter choke, which is an over-spec’d clone of an original mid-60’s Brit choke. This component is an important contributing factor to the ‘feel’ of playing through this amp, while filtering the rectified high voltage (HV) DC to a more significant degree. This means there is less power supply hash in your signal, ie less non-musically related harmonics. Our intention always is to build amps that just sound so damn good that you don’t want to put down that guitar !! The power amp section is where we have situated the master ‘tone cut’, which is like a passive presence control, and a key ingredient in the tone of these amps, plus the master volume. The design of the master volume enables the preamp to be overdriven at conversation levels, but at full clockwise rotation has no effect on your tone. However, for that chimey clean Brit-pop tonality we recommend setting the master volume to max, and running the amp ‘wide open’. Set the ‘tone cut’ control to personal taste – it is very useful for controlling the spikey high end of some single coil pickups. 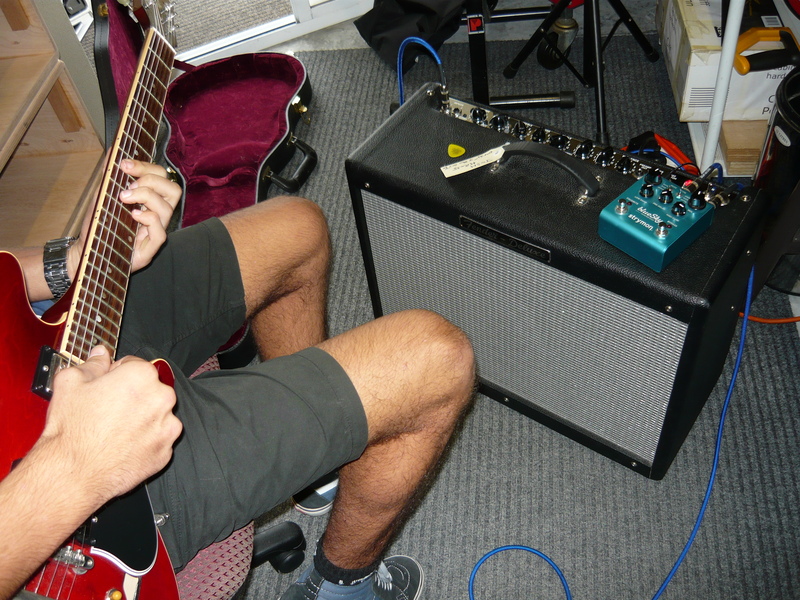 All our amps, regardless of which model, are designed from the outset to work well with your pedals. 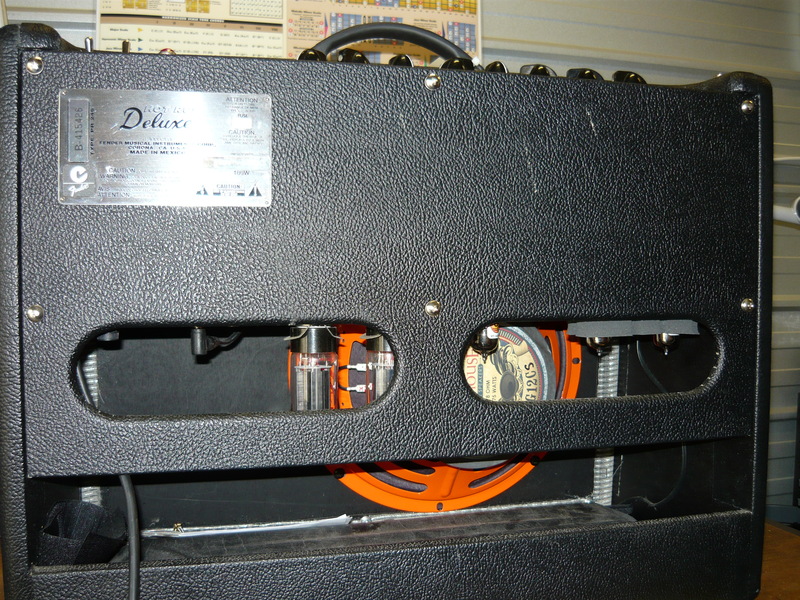 The pedals are intended to be patched between guitar and amp. We obviously cannot comment on every one of the thousands of overdrives/fuzzes/etc out there on the world market, but most of our customers are using various combinations of pedals/pedalboards very successfully with our amps. 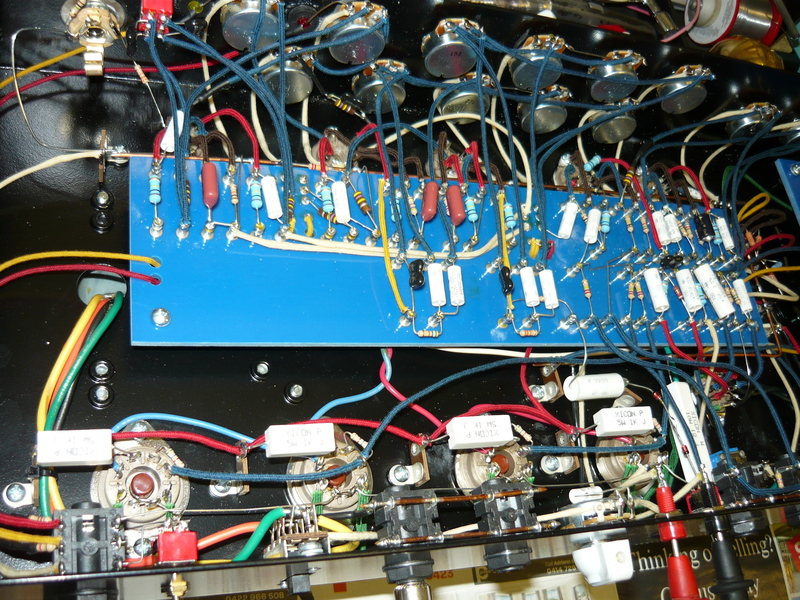 Each and every one of our amps is individually hand-built, one at a time, by one person, from beginning to end. It takes a lot longer this way, but it’s worth it ! Hello again. 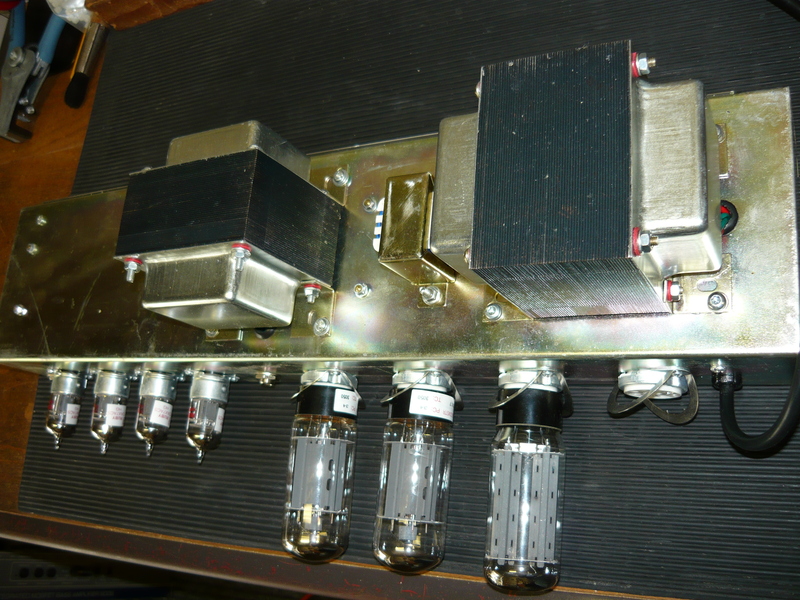 We are now offering world-class (non-warranty) service and repairs to Landry amplifiers of St. Louis, Missouri USA. 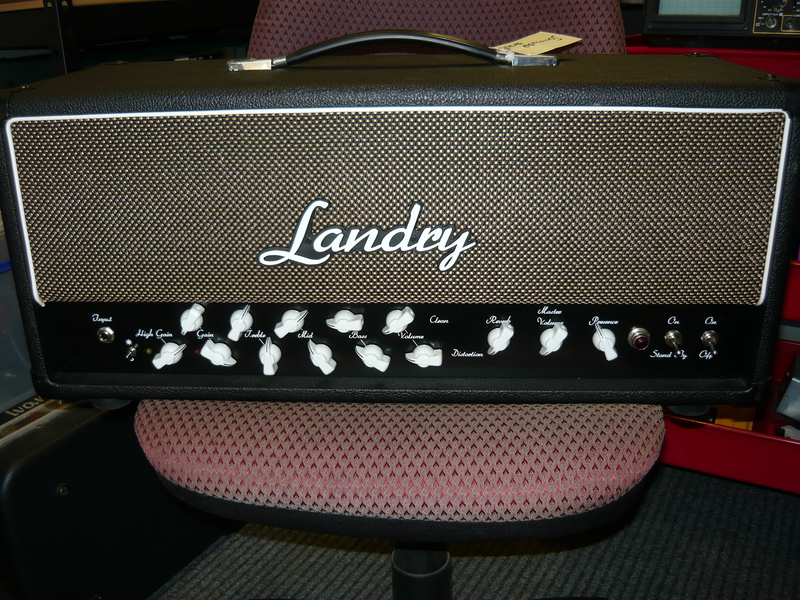 We should point out that we have no official relationship with Landry amplifiers, so we cannot accept any warranty repair claims without the endorsement of Landry or their Australian sales representative. 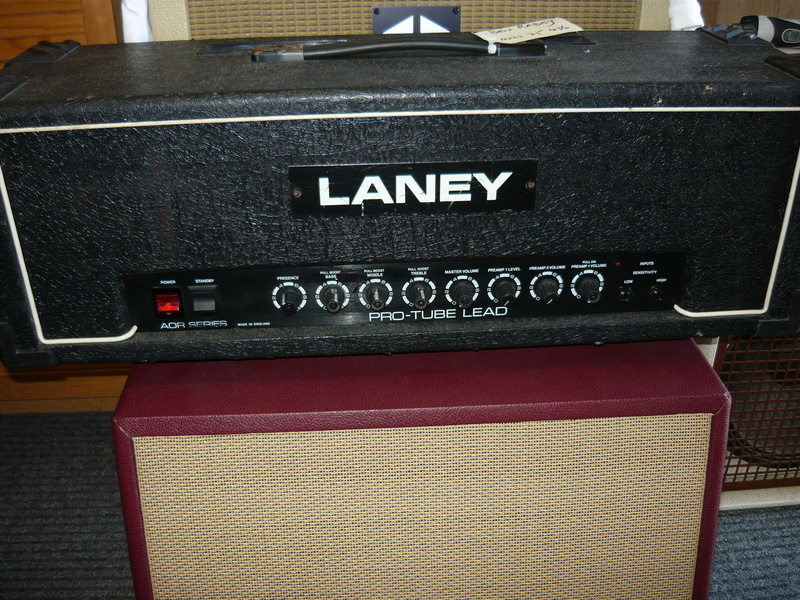 The Landry amp is a relative newcomer to the boutique guitar amp scene. 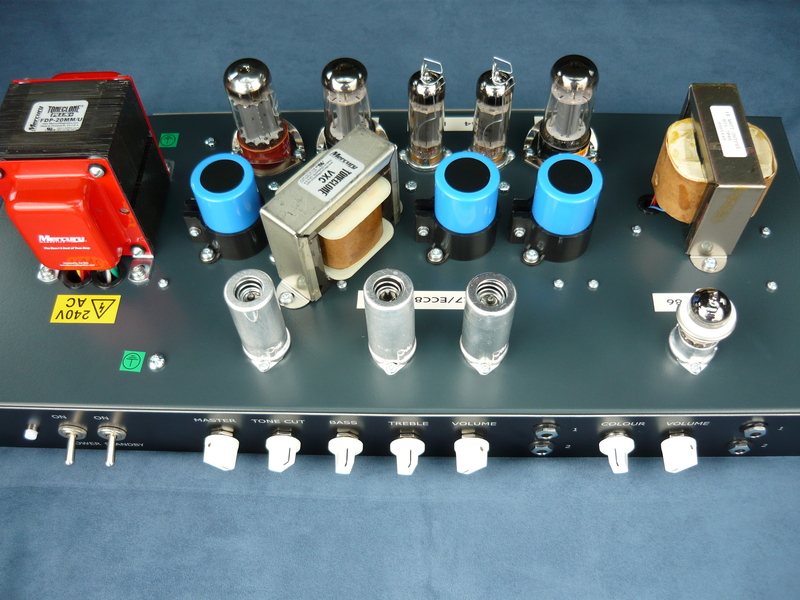 We endorse the fact that these amps are totally valve (tube) circuitry (apart from solid-state rectifier), and are completely hand-wired and assembled, presumably by one person. 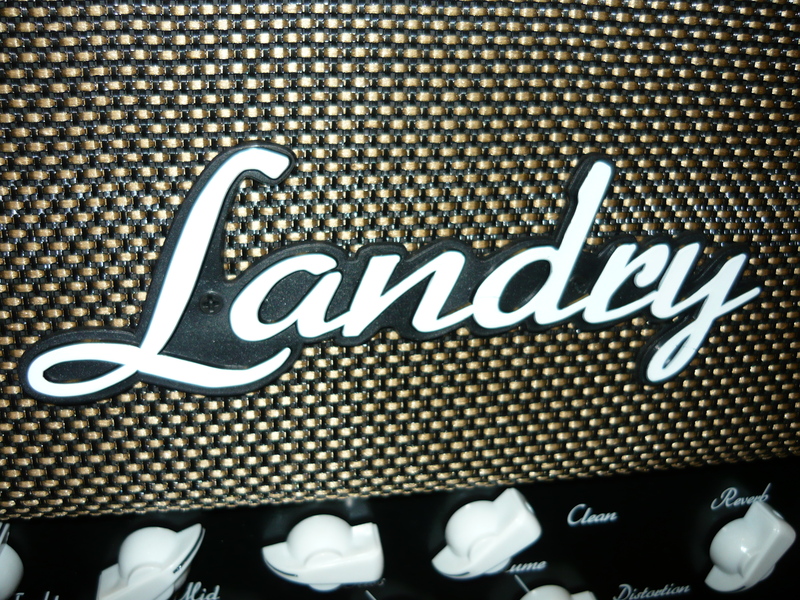 Landry are producing only one or two models, very obviously voicing their amps towards the classic British/Marshall sounds (in both channels), but with a number of enhancements and more modern high gain sounds available as well. There are two independent preamp channels, each with its own 3-band passive EQ. The ‘clean’ channel is voiced similar to a JTM45/Bassman style amp, and the ‘distortion’ channel is voiced similar to a JMP series amp, but with additional gain available via a footswitch. After the channel switching takes place the signal is routed via a valve-driven series FX Loop. The master volume is of completely conventional design, following after the FX Loop, but works very effectively in this amp design. The big surprise in a Marshall inspired amp such as this, is the inclusion of a valve (tube) driven reverb of very acceptable sound quality. Certainly much better than the reverbs ever were in Marshall amps over the years ! The phase inverter, power amp and power supply stages are very similar to what you would find in a 100 watt JMP Marshall. The power and audio output transformers are in fact the very excellent 100 watt JMP style models by Classic Tone/Magnetic Components of Chicago USA. The claim on the Landry website that the ‘clean’ channel delivers sparkling blackface tones is of course an exaggeration. This channel delivers the fatter JTM45/plexi/’59 Bassman type tones, and there is absolutely nothing wrong with that at all. 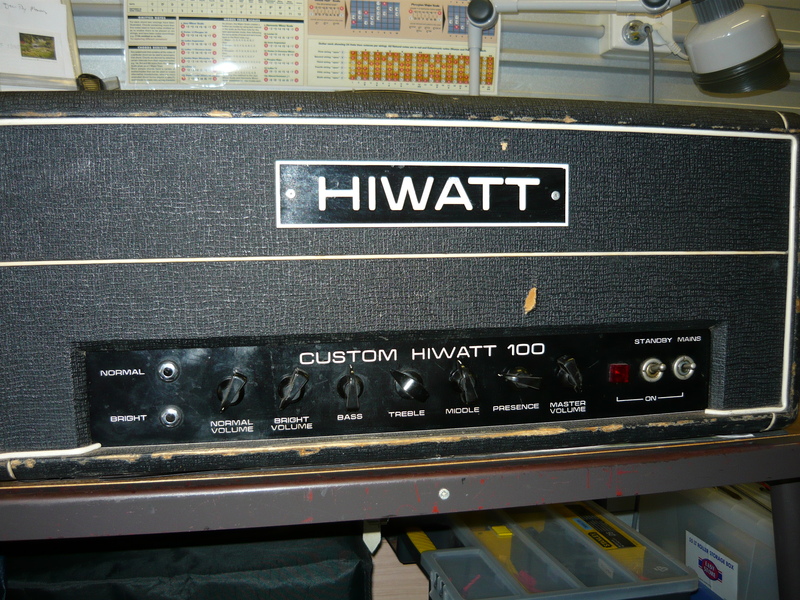 Our good customer, Steve Edmonds brought this 100 watt head into the workshop last week, stating that the amp had lost some of its magic. Please see our post of 25/2/2014 re the Steve Edmonds band, and new project Mescalero. 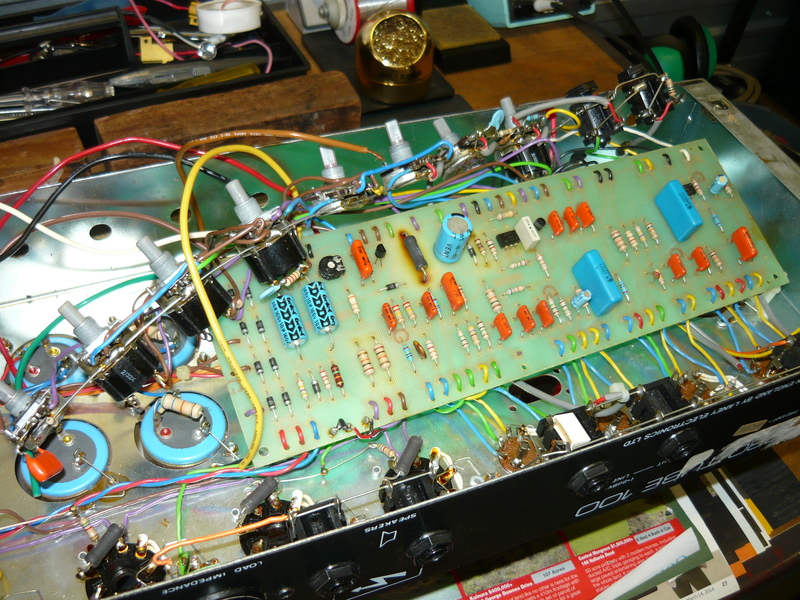 Inspection of the chassis revealed no apparent problems, but testing all the valves (tubes) separately from the amp did reveal most of them were in a degraded state, suffering from microphony, low gain, etc. 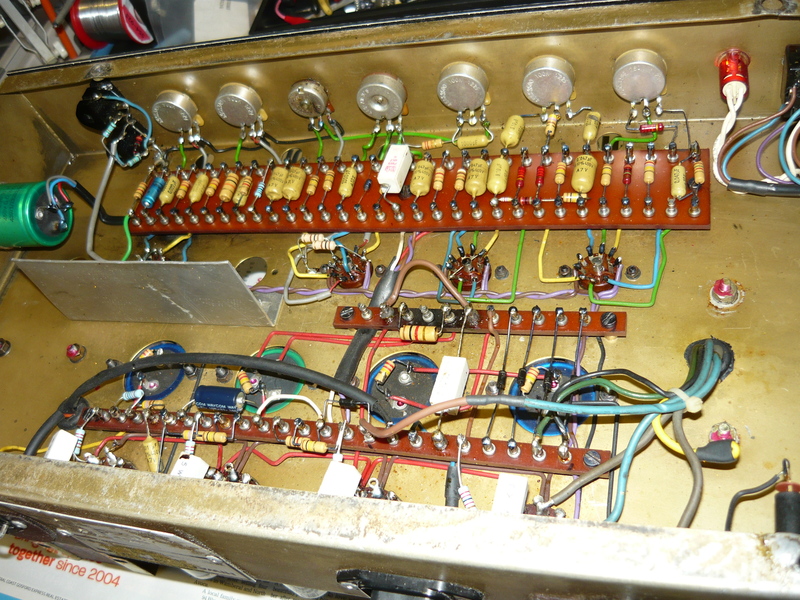 Apart from a Tung Sol (reissue) 12AX7 in position V1, all other valves (tubes) were Chinese 12AX7B and EL34B. Now this amp is really only a few months old, but Steve is currently the hardest working guitarist we know, generally playing four gigs per week. As a sweeping generalisation, Chinese manufactured valves (tubes) can quite often sound very good indeed when brand new, but can also lose their quality relatively quickly. Their 12AX7’s especially seem to become not only microphonic but also rather harsh and brittle. No doubt they will improve their quality of manufacture over time, the Russians certainly have. We installed a mixture of JJ, Electro-Harmonix and Tung Sol (reissue) valves, pre-tested and graded in our workshop, making an effort to select the ideal valve for each position. For the output stage we installed a matched quartet of Tung Sol EL34B, which have been certainly the most reliable of current production EL34’s (in our experience), although they do sound different to other EL34’s – therefore the customer’s personal tastes have to be taken into account in these situations. Rebiasing the Landry for new output valves is easy and convenient – I wish the major manufacturers would take note ! All four EL34 cathodes are connected together to ground via a 1 ohm/10 watt resistor, which in turn is connected to external DVM test points. Simple ! The amp passed its power output and burn-in testing with flying colours, and it seems that Steve is very happy with what he was hearing at last week’s rehearsal. Many thanks to Steve Edmonds for his continued support and for supplying us with the subject matter for this blog. IR. Thanks for checking in to our blog. From time to time we like to share our experiences in upgrading our own instruments, as distinct from customer repair work. This week we discuss an Australian made instrument – the Belman Albatross (standard). The most recent similar blog was published November 24 2013, regarding a ’52 Tele (reissue) upgraded with the marvellous Pete Biltoft pickups, plus an upgrade of an ESP Tele. 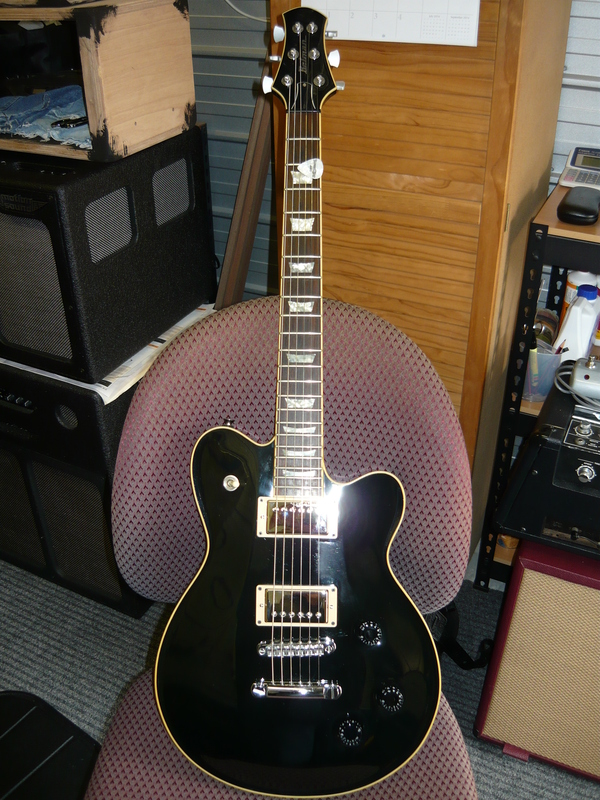 We purchased the Belman at the beginning of this millenium from East Gosford Music (NSW). The proprietor, Trent Crawford, was one of the first stockists in NSW (as far as we were aware) of the Belman guitar and was a Belman player himself. Trent enthusiastically promoted the Belman, and quite a number of local Central Coast players (including myself) purchased the Albatross and subsequent models such as the double-cutaway. The thing that struck us all was the consistent quality of construction and assembly of these instruments, especially when making direct comparisons to the leading imported brand (at that time), selling for twice the price or more. Another unique aspect of the Belman was the use of exotic Australian tone woods. 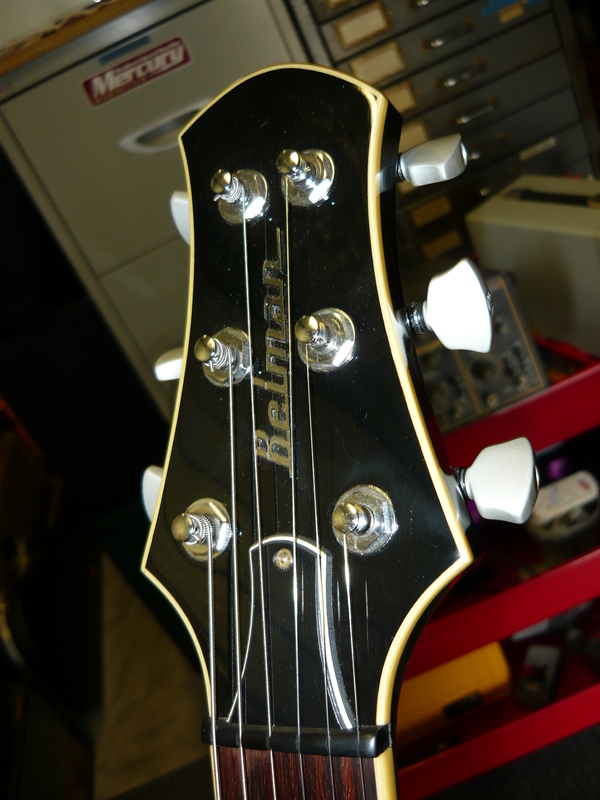 Belman guitars were hand-made in Melbourne, Australia from 1994 to 2007. I recall visiting their factory in Thomastown (Victoria) in the company of Bob Spencer, who was in the process of ordering a customised model. Belman was only ever a small operation, involving just a handful of people. Like many such small businesses in a highly competitive industry, they were under-capitalised and had no choice but to stop production in early 2007. For a more in depth discussion of the Belman models – see the Jedistar Belman Page. East Gosford Music also closed their doors a few years back, due to the shift in musical instrument retailing from bricks and mortar to on line. Trent, however is still very much involved in the music industry – see Trent Crawford Music. With the Belman Albatross – I always thought that the electronics let the guitar itself down very badly. The pots, 3-way switch and jack socket were all just a bit cheapo, and were upgraded to Switchcraft and CTS components a.s.a.p. All the other Belman hardware was excellent. We don’t understand the reasoning behind these choices, as the RRP of the Albatross at that time was $2,399 ! Please note: when replacing cheapo guitar pots, the mounting holes will usually have to be carefully enlarged to 3/8″ diameter with a suitable reamer. I was never happy with the high output pickups either, and didn’t feel that they were bringing out the best in this instrument at all. This particular issue of course applies to thousands of guitars out there, a fact which supports a whole after-market guitar pickup industry. 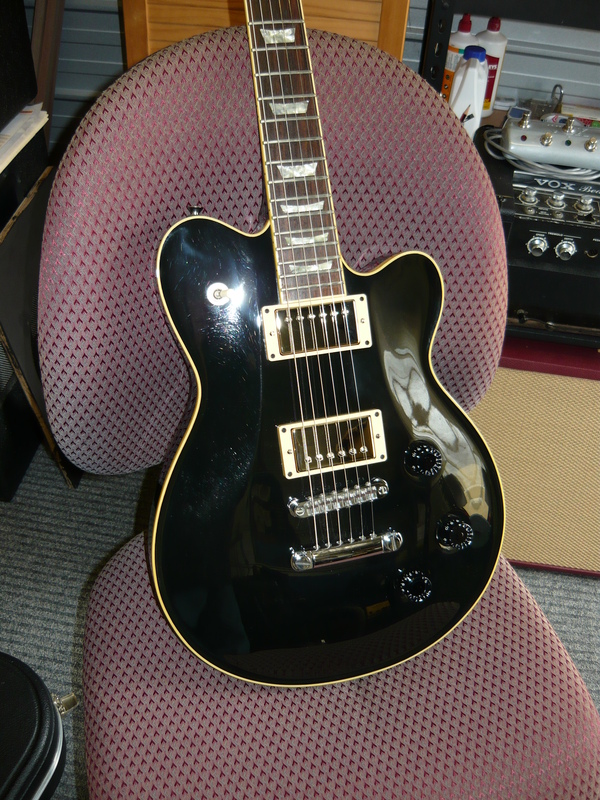 Next, I installed a set of Lindy Fralin humbuckers which also were too hot and therefore too muddy. I probably should have researched my requirements a lot more, as Lindy Fralin offer many choices from underwound to overwound. I went through a P90 obsession phase, and installed a set of Seymour Duncan Phat Cats, which are P90 pickups modified to install in a standard humbucker mounting. I still wasn’t getting the combination of warmth/sweetness/clarity/articulation that I was craving so badly by now. I knew the problem wasn’t the guitar itself – the solution could only be achieved by matching up the right choice of pickups. 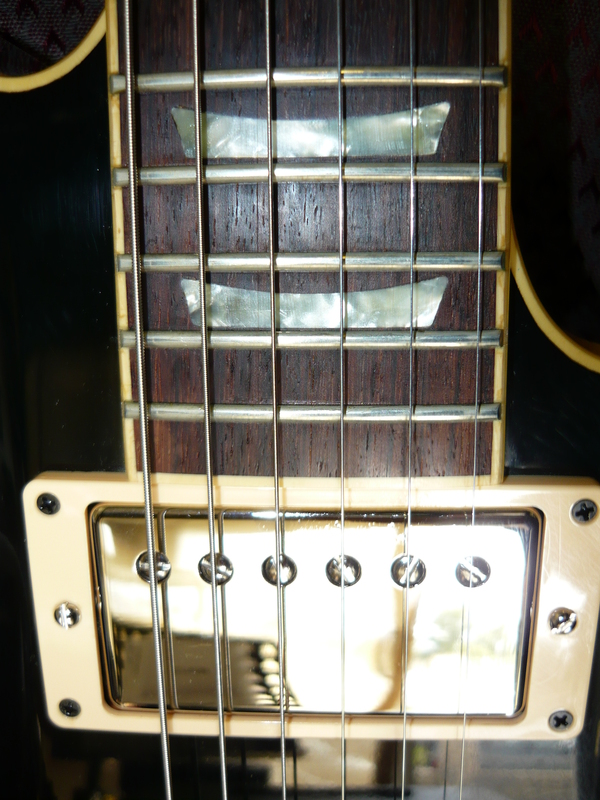 Last year I upgraded the neck pickup in my ESP Ronnie Wood Telecaster (also purchased from EGM), with a Seymour Duncan ‘Seth Lover’ humbucker, with the best results so far in that guitar, paired up with the ‘Jerry Donahue’ bridge pickup (both Alnico II). I ordered a set of Seymour Duncan ‘Seth Lover’ pickups, SH-55b (8.07K) and SH-55n (7.33K), from a dependable supplier Darren Riley, for around $100 ea USD. I could have spent well over $400 AUD acquiring the new Joe Bonamassa signature pickups, or some other more exotic boutique models, but exercised some restraint and I’m pleased I did, because these pickups have worked wonders for my Belman which now has mucho warmth without compromising on clarity, and the amp can be easily cleaned up from the guitar volume control, which is always a good thing. The tone is vintage PAF to be sure, but these pickups can still supply enough boldness and punch for most applications short of heavy rock and metal. IR. Hello and welcome to the blog. 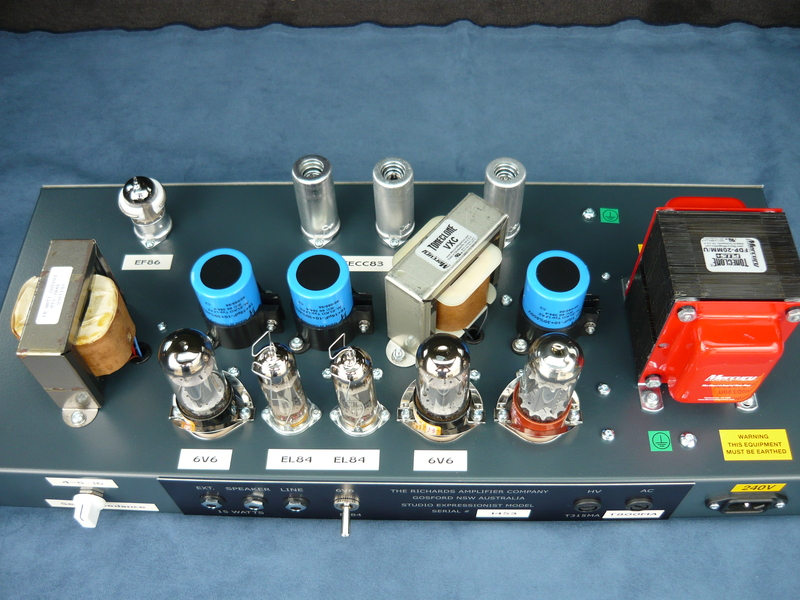 Once again we have completed major repairs to a Laney (UK) “AOR Series” amplifier – model name Pro Tube Lead, this time a 100 watt head for customer Ben Rabey. 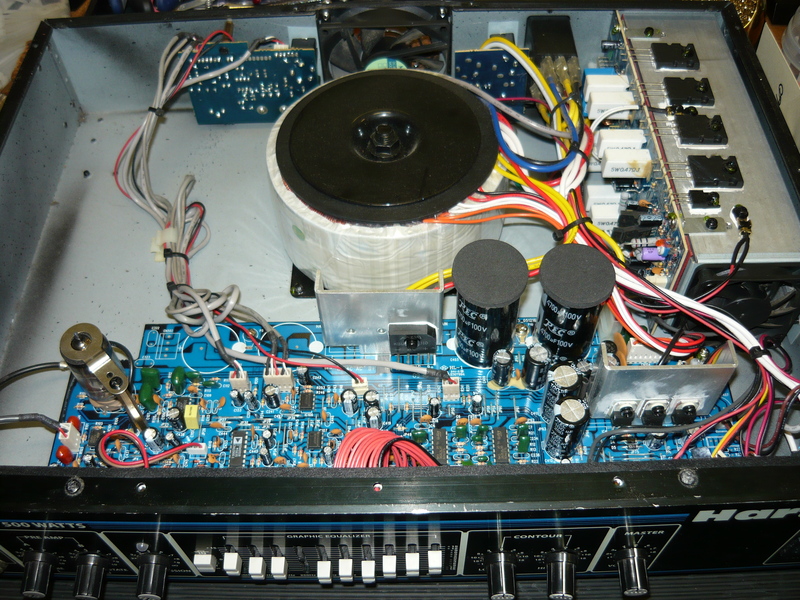 We previously published blogs on 14/5/2013 and 10/7/2012 describing repairs and MODs to Laney amps in detail, including the AOR Series 50 watt combo, and also the LC30-II combo. The fault description from our customer was that the amp plays OK for a while, and then the output drops markedly ! 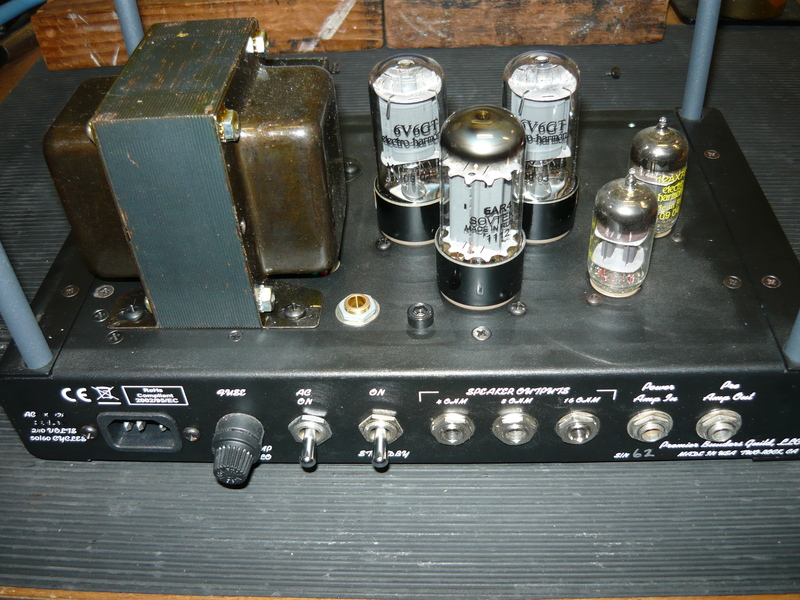 Upon removing the chassis from its sleeve, the first things we noticed were that the mains fuseholder was loose and could not be tightened satisfactorily, plus the amp was seriously under-biased resulting in a much higher than normal current draw by the quartet of EL34 output valves (tubes). removing and reinstalling the board is quite a task, but has to be done ! We replaced the fuseholder altogether with a current production unit that complies with contemporary electrical safety standards. We also installed the correct value HT fuse – T1A. Following this, the amp passed electrical safety testing to Workcover NSW standards. This is all important stuff, and should never be overlooked. We tested the quartet of EL34 valves and all the 12AX7 preamp valves externally to the amp with no apparent problems revealed. access to much of the wiring is under the board, but available space is very tight ! After re-installing the valves (tubes), we rebiased the EL34’s to a sensible current draw. The amp tested both very low and very distorted output signal into a dummy load. We observed a good drive signal to the EL34’s from the phase-inverter stage, with a signal injected at the FX Loop ‘return’ jack, so we had every reason to suspect that the output transformer had broken down internally. We quoted Ben on replacing the output transformer plus other tasks, and the project proceeded. As we are an authorised repairer for Marshall amplification, we therefore have access to the full stock of Marshall spares for current and vintage models. It just so happens that the 100W output transformer for the JCM800 series, designated C2668 (by Dagnall Electronics), is a perfect match and perfect fit for the 100W Laney. This is hardly a surprise, as the Laney is very obviously based on the JCM800 design, but with additional gain and additional features. Getting access to the wiring to carry out this task is not easy, as much of the wiring passes underneath the single large printed circuit board (PCB). 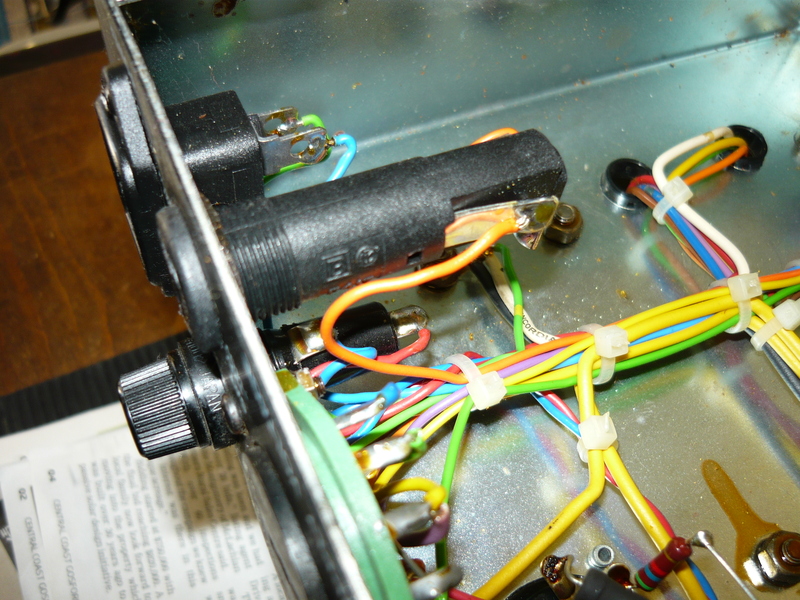 Definitely not mil-spec wiring, but the JCM 800 amps are exactly the same (although their wiring is somewhat tidier). Removing the board requires removing a number of fasteners, plus also removing all the front panel controls, as all these controls are hard-wired to the board, as you would expect. The replacement C2668 transformer wiring of course has a completely different colour code to the original Laney unit, which required some additional investigation to complete the installation successfully. While we had both sides of the board exposed, this was the perfect opportunity to replace the bias supply filter caps, plus some of the low-voltage supply components (as per the previous Pro Tube Lead repair job). You can see a burn mark on the component side of the board under a power resistor in the low-voltage supply, so this appears to be a common problem in these amps. 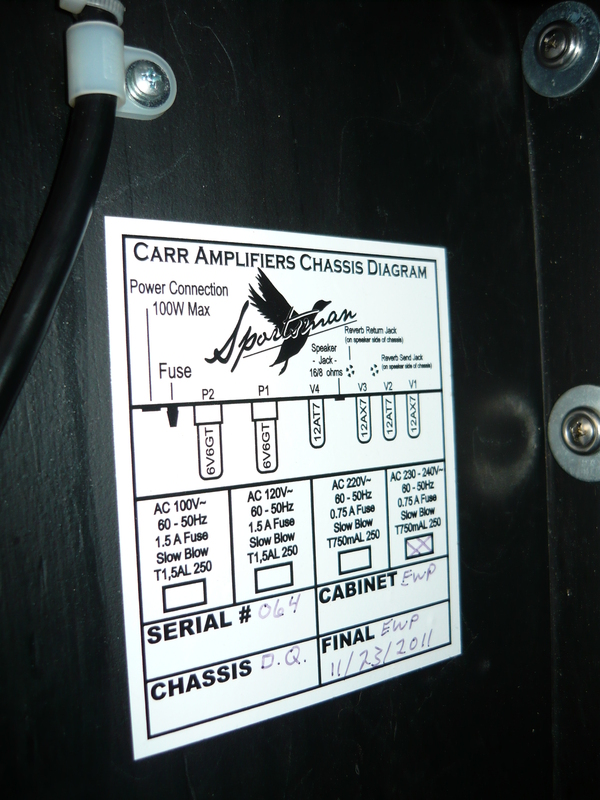 For those interested in technical matters, this amp was serial # 2685, and appears to have been built in 1988. After installation of the new transformer and rebias of output valves (tubes), we had a high-tension voltage supply of just under +470V, and a bias voltage of -38V. The amp delivered 43V into 16 ohms @ the onset of clipping = 115 watts. Was the blown audio output transformer a direct result of the under-biased output valves ? We will never know – sometimes these are just random events. Many thanks to Ben for his continued custom. As always with these models – once set up and running properly the amp sounded huge ! IR. 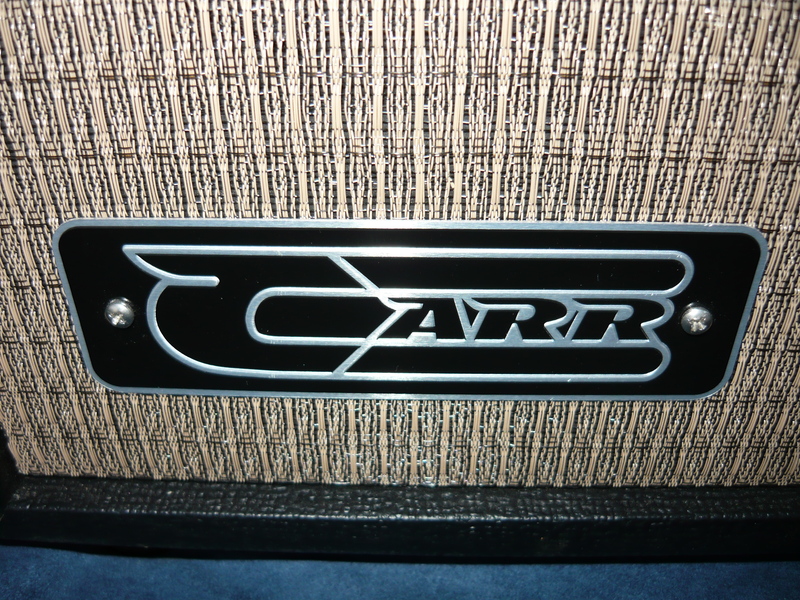 We have had a relationship with Carr amplifiers of North Carolina, USA, going back several years to when the former Bondi Intermusic Australia began importing these amps. Of course Bondi is long gone, so therefore we are no longer the national warranty service agent as the brand has been taken over by another distributor. However, with the full approval & support of Carr USA, we are still providing post-warranty after-sales-service to the entire range. We have previously published blogs re the Carr Artemus and other models in the range. The Sportsman model is a relative newcomer to Australia, and this is our first servicing experience with this model, for new customer Matt. 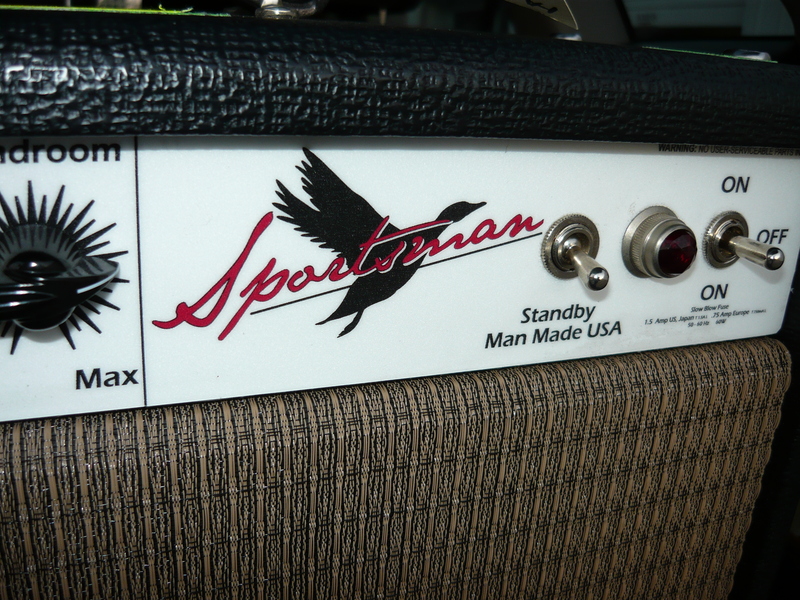 The design of the Sportsman follows on from Carr’s most successful models, being somewhat like a hot-rodded “blackface” Princeton Reverb amp. That’s the best way we can describe it, although there are some differences, particularly in the phase-inverter and power amplifier circuits. The power amplifier is designed around a pair of 6V6 output valves, employing a form of compound bias – combining both fixed bias & cathode bias, with a power output @ the onset of clipping of about 16 watts into a 16 ohm load. This arrangement seems to work well in practice, although when Fender (as a division of CBS) tried something similar in the late 1960’s the results sounded so bad they had to implement a redesign of the “Silverface” models. 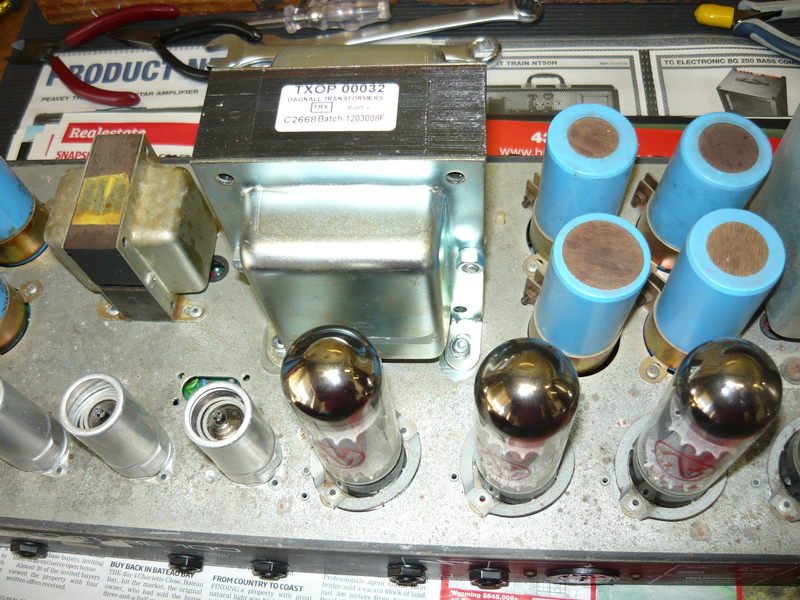 The power supply uses solid-state rectification, as opposed to valve (tube). The “headroom” control is actually a master volume with some tone shaping, following on from the final preamp gain stage. 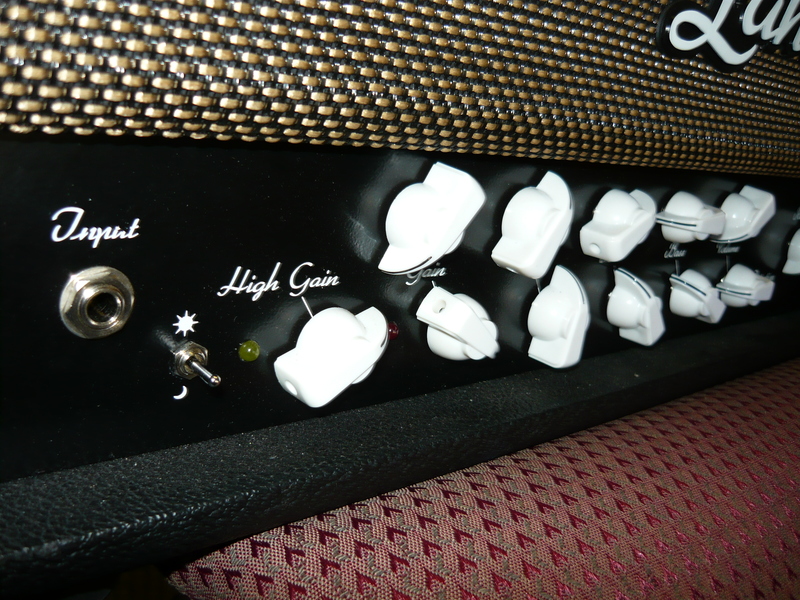 As per the Two-Rock amp discussed in the previous blog, this control is intended to manage the gain structure of the amp, rather than introduce distortion, hence the “headroom” label. The reverb on this amp is exemplary, which is a real contrast with the many current production guitar amps offering really poor reverb !! 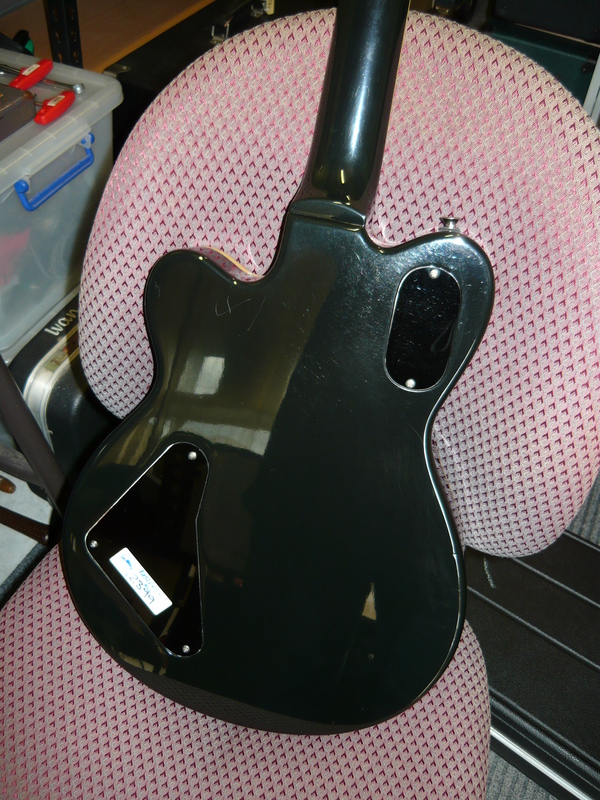 There is no tremolo on this model. 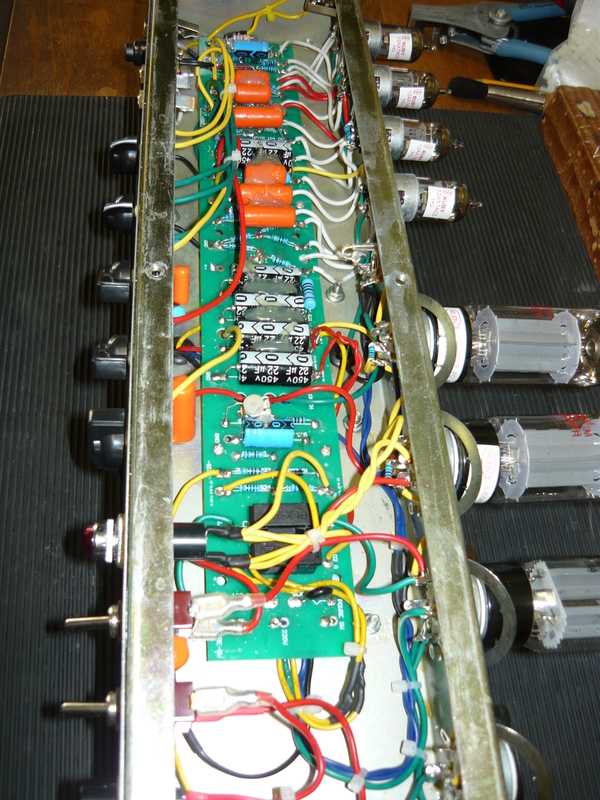 The chassis is completely hand-wired. Matt reported that although the amp was still functioning, the sound of the amp had deteriorated markedly. We examined the interior of the chassis looking for any signs of component failure or drift, but chassis checked out A-OK.
We carried out a full re-valve and once more the Sportsman was delivering the kind of attitude that Matt was missing. The one and only concern we might have with this amp is the minimal ventilation for the horizontally mounted 6V6 output valves, which are biased to run quite hot. We have to thank new customer Matt for providing us with the subject matter for this blog. I think the only remaining question for Australian guitar players would be – could you buy an amp with a duck on the front panel ?? IR. Hello and welcome back to the blog after a long break. 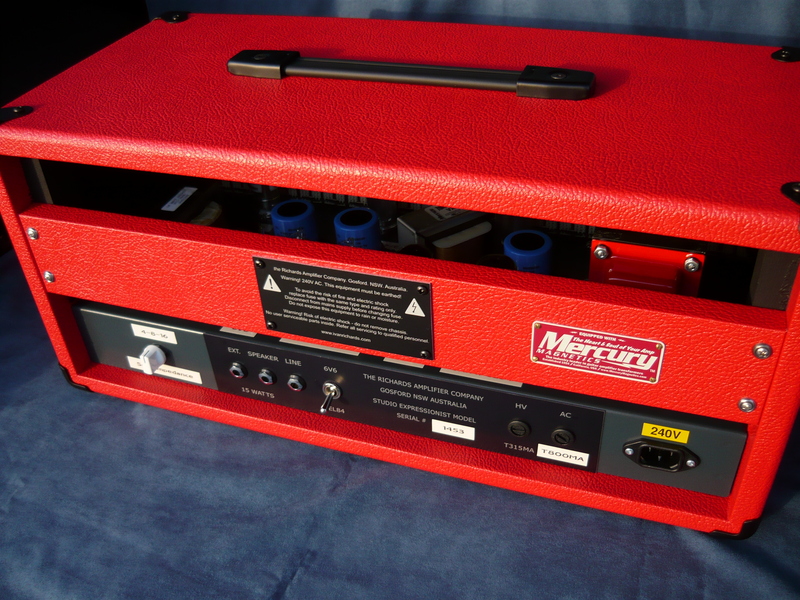 We are now offering world-class (non-warranty) service & repairs to the range of valve (tube) amplifiers from Two-Rock guitar amplification of California, USA. We should point out that we have no official relationship with Two-Rock Amplifiers, so we cannot accept any warranty repair claims without the endorsement of their Australian distributor. 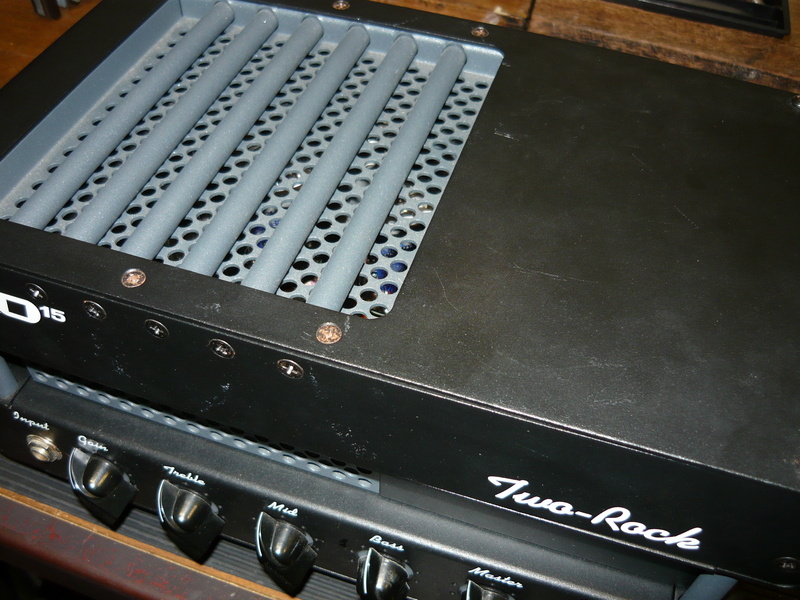 We recently serviced the Two-Rock EXO15 head (serial # 62) for Sam, one of our regular customers – the amp is featured in the accompanying photos. Sam advised us that the amp ‘just stopped’, which is a fairly common amp fault description, and in most cases would suggest a valve (tube) or other component failure, or at least a blown fuse. The EXO15 is a single-channel, 15 watt 6V6 powered and valve (tube) rectified class AB amp, designed in an all-metal enclosure, with a pair of 12AX7 preamp valves (tubes), one of which functions as the phase-inverter. 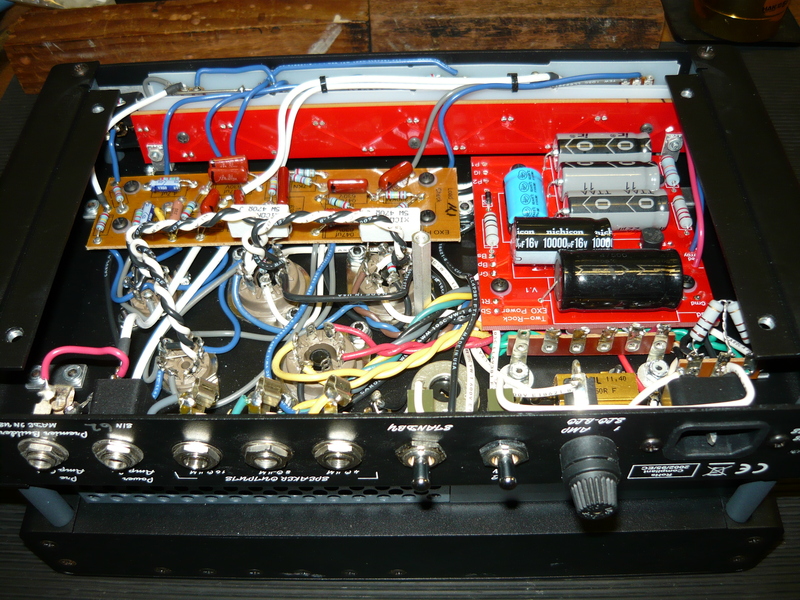 The preamp design is somewhat similar to the “clean” channel in a Dumble guitar amp, as per the Two-Rock heritage, and the 3-band passive EQ is also voiced along similar lines. The master-volume is placed directly after the 2nd gain stage, and is therefore intended more for managing the gain structure than generating massive amounts of distortion (a design approach which we endorse). 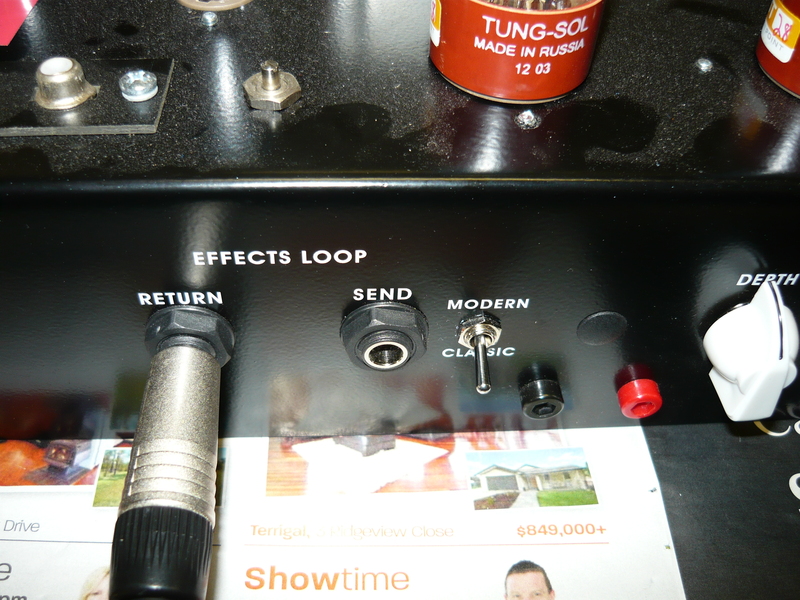 The master feeds a passive FX Loop, for time-based FX devices that can accomodate line levels. In spite of the name & description, the “contour” control is in this case a simple passive high frequency roll-off, as per the vintage VOX AC15/AC30 amps. 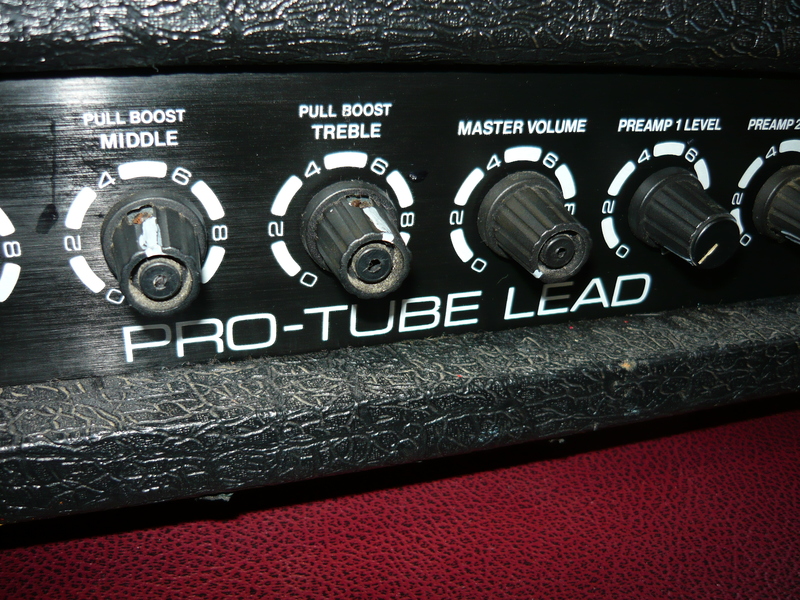 We heartily endorse the inclusion of a GZ34/5AR4 valve (tube) rectifier in an amp of this power rating. Anecdotal evidence from the customer suggests this hasn’t been a particularly reliable amp. As this is our first service job on this particular amp, we are not familiar with its previous service history. Assembly is a combination of circuit boards and hand-wiring. 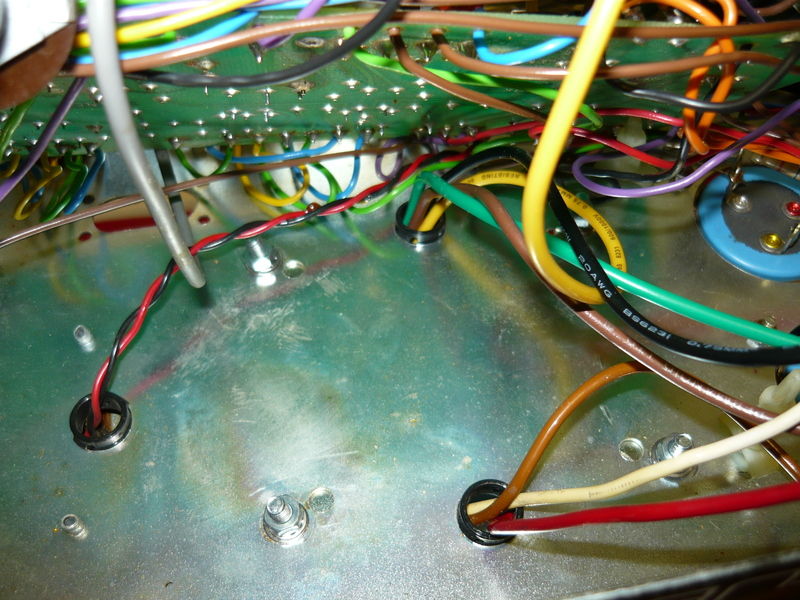 All connections to valve sockets, jacks/pots/etc are hand-wired which of course we endorse. Components are of commercial standard but not “boutique” standard, with no apparent design problems. We replaced the blown mains fuse, and also the output valves & rectifier valve just to be on the safe side. Our initial choice of JJ 6V6 output valves was not a success, as they are too tall for the cover to fit back on !! We ended up installing a matched pair of 6V6GT by Electro-Harmonix, which have been pretty reliable at the voltages within this amp (+440V DC in our Wyoming NSW workshop). We rebiased for a sensible current draw with the 6V6’s (this may have been the problem all along ?? ), and measured the power output @ the onset of clipping = 22 watts. We were looking for any other factors which may have contributed to the unreliability factor, at Sam’s request. When we looked at the speaker output jacks (4, 8 & 16 ohms), we were really disappointed at the nondescript quality of the jacks installed, and their current condition. We installed a trio of the very fine Switchcraft jacks, which grip the speaker plug very firmly for a positive connection. H/R (high resistance) or O/C (open circuit) speaker connections can cost you not only your output valves, but potentially also your output transformer. Always use the best available jacks & plugs for such critical connections. Thankfully, no further problems have been reported with this amp. Many thanks to Sam for his continued custom, and for supplying us with the subject for this week’s blog ! IR. For this week’s blog we discuss an upgrade guitar speaker from the WGS [ie Warehouse Guitar Speaker] range – the G12C/S. This model is from the WGS ‘American Vintage’ range, and features a ceramic magnet, a smooth cone [hence the ‘S’ suffix], and a 75 watt power rating. We have been supplying Celestion and Weber guitar speakers for years now for our own Richards amplifiers, plus existing amp upgrades. But more recently we have additional upgrade speaker choices available from WGS. The G12C and G12C/S are obviously voiced for Fender style amps, and have that big American ‘clean’ sound, but with warmth and character. The smooth cone version is great for the brighter amps, and the seamed cone version is ideal for darker amps. 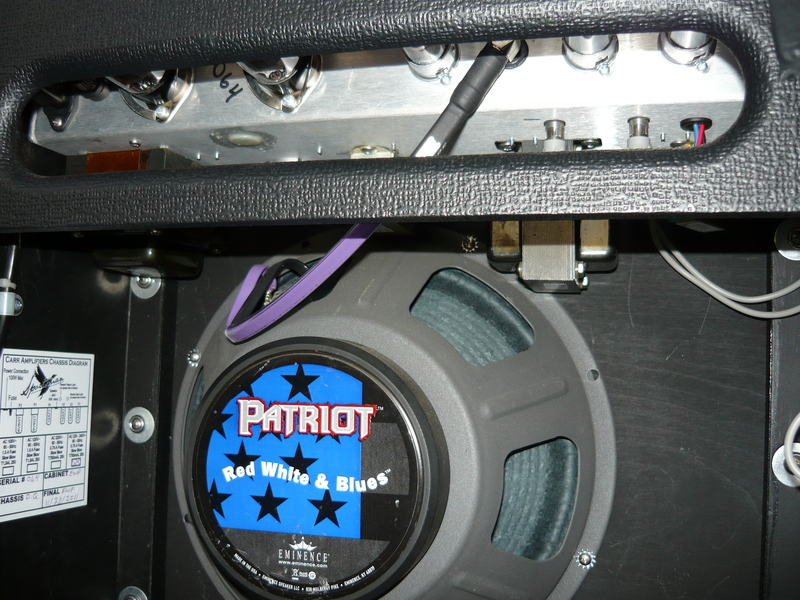 This week we upgraded the stock Eminence speaker in a Fender Hot Rod Deluxe for new customer, Josh. The stock speaker is rather bland, as is often the case, and is rated for 50 watts only, which doesn’t allow a comfortable overload margin with a 40 watt valve amp. To say that Josh was pleased with the end result would be an understatement ! Josh plays a Gibson ES339 and is a jazz stylist and also plays a wide variety of styles in a church band. The improvement in tone, headroom and clarity from the upgraded amp was immediately apparent. That’s a Strymon Blue Sky reverb pedal sitting on top of the amp, and the leads are Dimarzio, also highly recommended. Our all time personal favourite from the WGS range is the ET-65, which is their reinterpretation of the classic Celestion G12-65. 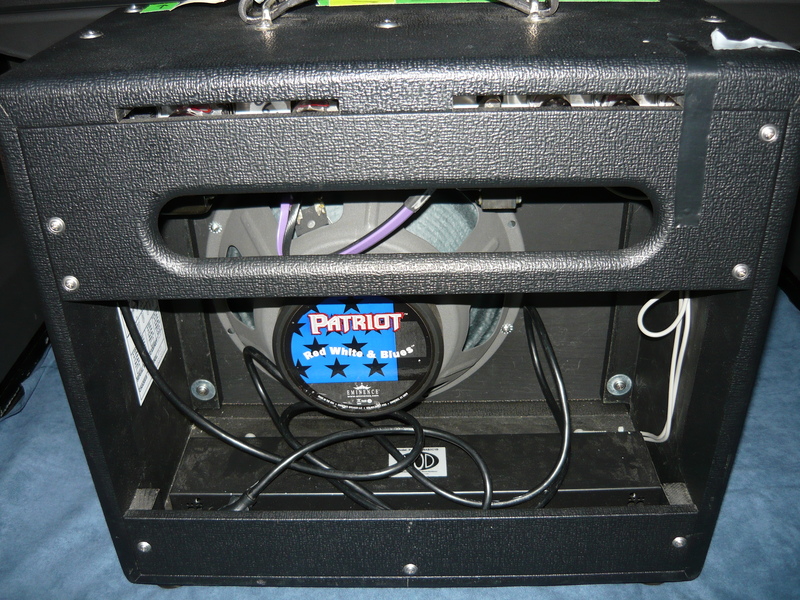 It works amazingly well with both ‘British’ and ‘American’ voiced amps – very versatile. 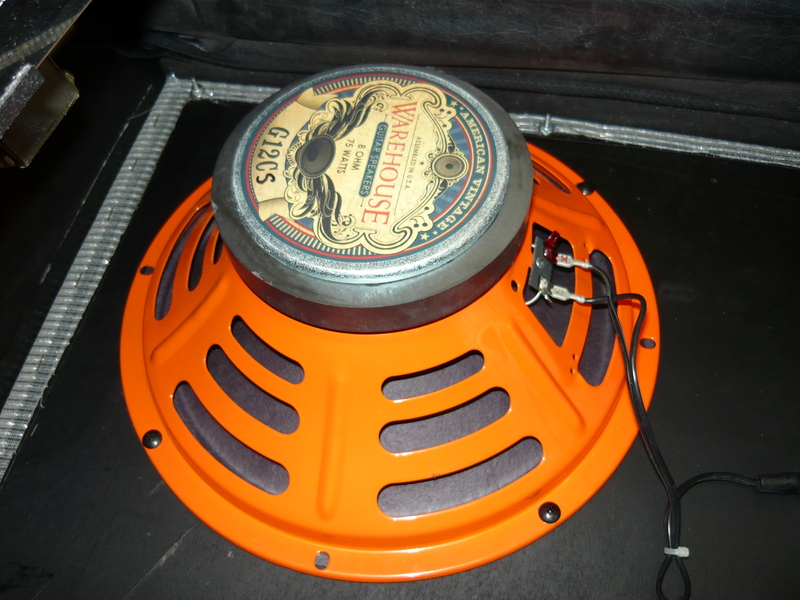 We have also recently tried the ‘Invader 50’, which is based on the famous Celestion ‘Greenback’ speakers, but beefed up to 50 watts, with more bottom end as well. WGS now have a distributor in Australia – our buddy Brad from The Speaker Factory in Brisbane. So now we can upgrade your amp with Celestion or WGS speakers ex-stock in Australia. Happy Easter 2014 ! IR. Hello & welcome back to our blog. 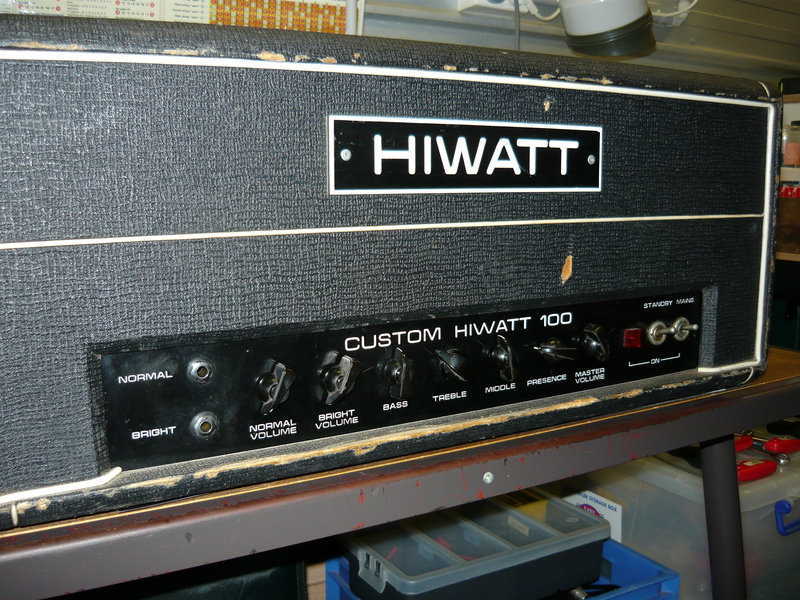 We recently carried out service & repairs to a 1978 Hiwatt [UK] DR103 amplifier which obviously has had a long & hard working career in rock & roll bands. This DR103 is the 2-input model with active mixing of the normal & brilliant channels, as distinct from the late 1960’s/early 1970’s 4-input model with passive mixing of the two channels. We suspect that both versions of this model have their fair share of admirers. 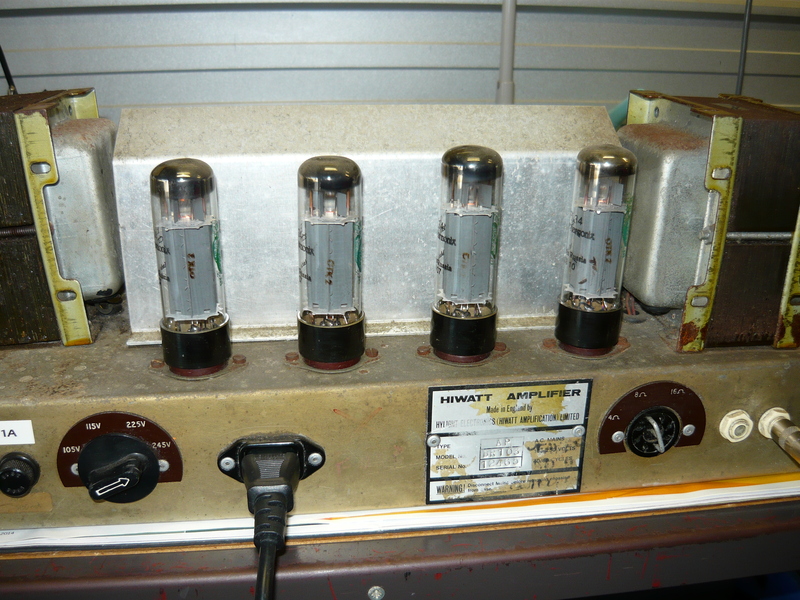 This amplifier was working but had issues with microphony and very scratchy pots – some pots had dead areas on their sweep, so were barely useable. 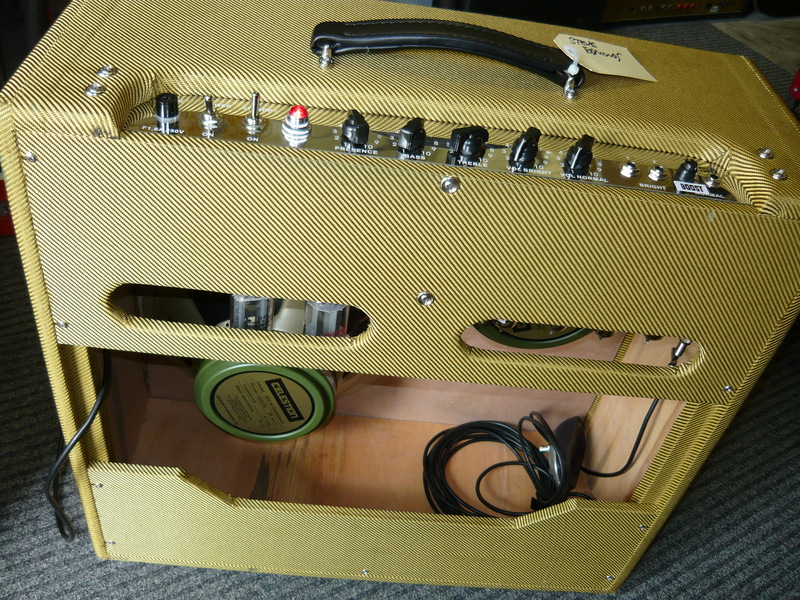 The amp had been modded by persons unknown further back in its history. The high frequency response of the brilliant channel had been boosted to ear-drum shredding levels, and was to all intents & purposes unuseable. 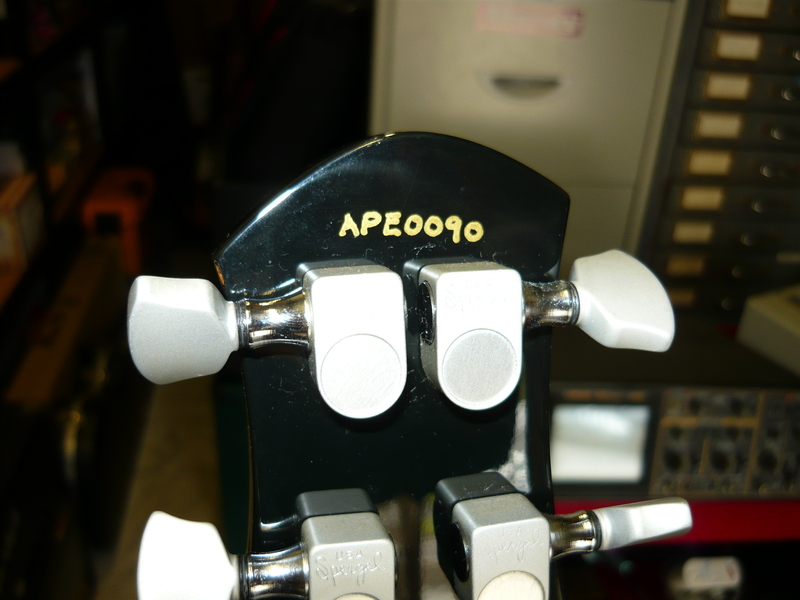 Apparently the previous owner had only ever played on the neck position humbucking pickup of his 335 style guitar, hence the need for extreme high frequency pre-emphasis. In addition to this problem, the amplifier had high levels of hum & noise. We started out by giving the chassis a quick clean up and tightened up a loose transformer. We checked the fuses, and as is so often the case in older amps, they were not offering any protection at all as they were the wrong values ! We installed new fuses, carried out an electrical safety check [PAT test], then moved on with the main part of the service. All pots [excepting bass & treble] were in very poor or damaged condition, so we replaced them with those excellent CTS pots. One source of unwanted noise came from the input jacks – they weren’t shorting to earth [ground] when the guitar lead jack plug was removed. We cleaned all input & output jacks, plus the 9-pin valve sockets with DeOxit, which corrected the remainder of the intermittent problems. 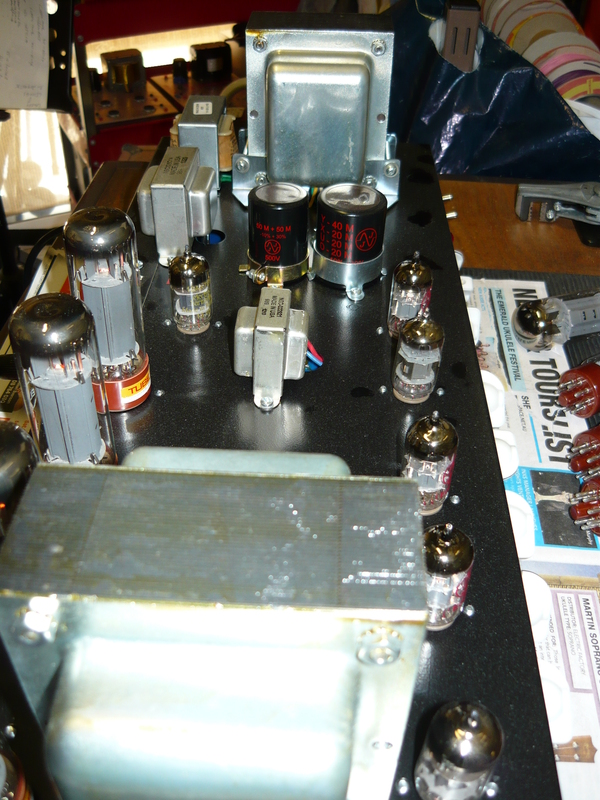 Two only of the preamp valves were tested as being faulty and/or microphonic, so we replaced those accordingly. All other valves, including the quartet of EL34’s tested OK. 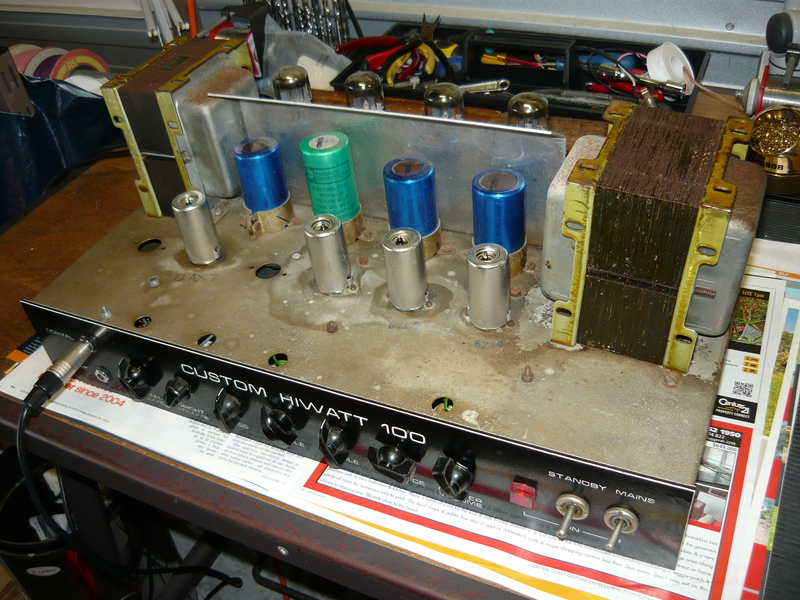 This amp has obviously been in regular use since manufacture in 1978, and the various electrolytic capacitors in the power supply still appeared to be serviceable. As the customer’s budget did not allow for complete replacement of electrolytics, we left them alone. There was still a remaining source of hum within the amp, and this turned out to be a lack of earth [ground] reference for the 6.3V AC heater filament supply. The pair of 100 ohm resistors that provided a virtual centre-tap for the 6.3V AC looked perfect but measured O/C. We fixed this problem with the installation of a pair of 100 ohm 1 watt resistors. 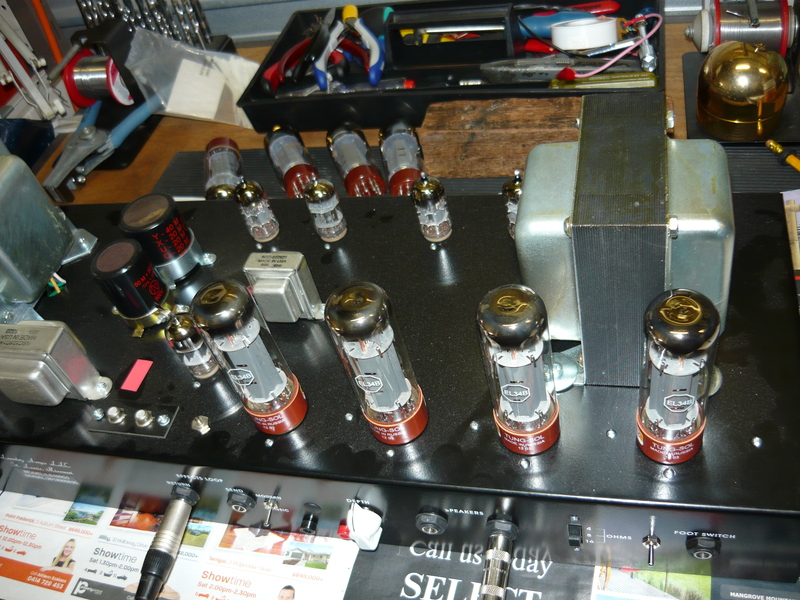 The final issue to be resolved was removing the MODs to the front end of the amp. 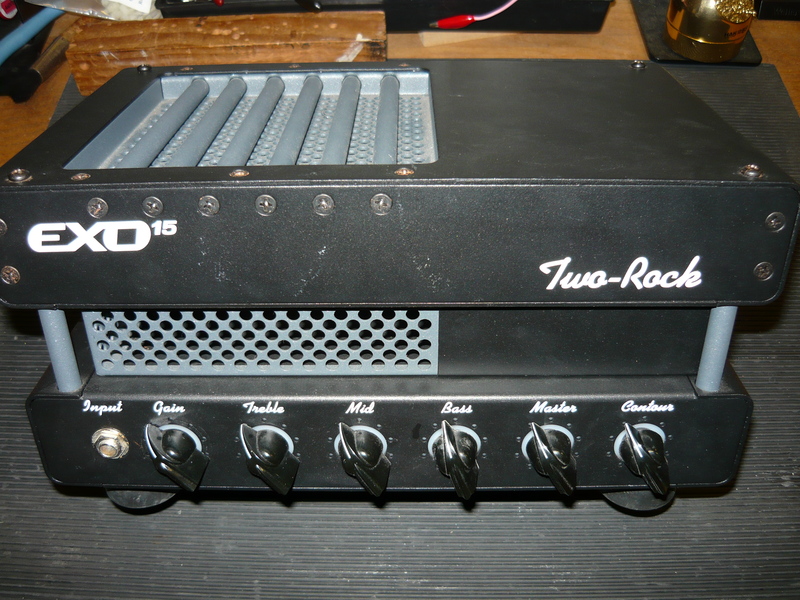 This DR103 already possesses a very bright voice, especially when plugged into the brilliant channel. The amp had been modded with a double layer of additional brightness, so the brilliant channel was unbearable with a Strat or a Tele. 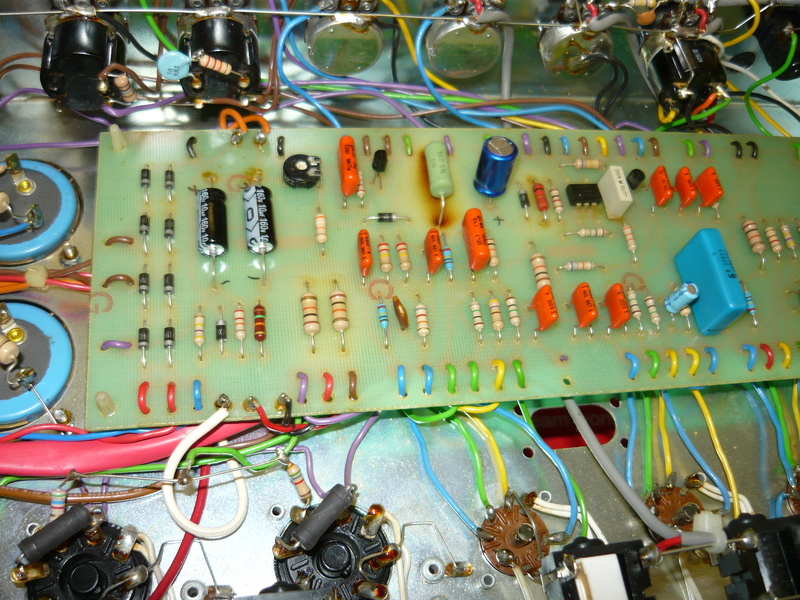 We restored the front-end circuitry to original spec, removing both MODs. How does this amp sound now ? Just fantastic, actually, although at 100 watts I would get thrown out of every gig we do these days, not to mention making my existing tinnitus problem even worse ! It’s just so British, with a warm & fat midrange, sweet & crisp top-end, and a tight but powerful bottom end. I love the balance of tone across the 6 strings of the guitar, but unfortunately for this amp to sound at its best, you have to play bloody loud. 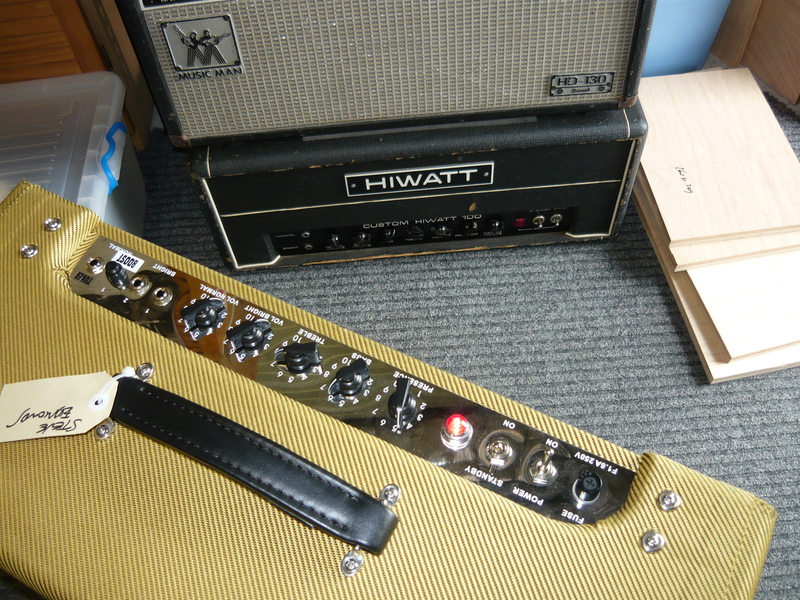 So, we heartily recommend vintage Hiwatt amps as an investment for all you amp collectors out there – they were so well made in the first place, and are a pleasure to work on from the techo’s perspective. 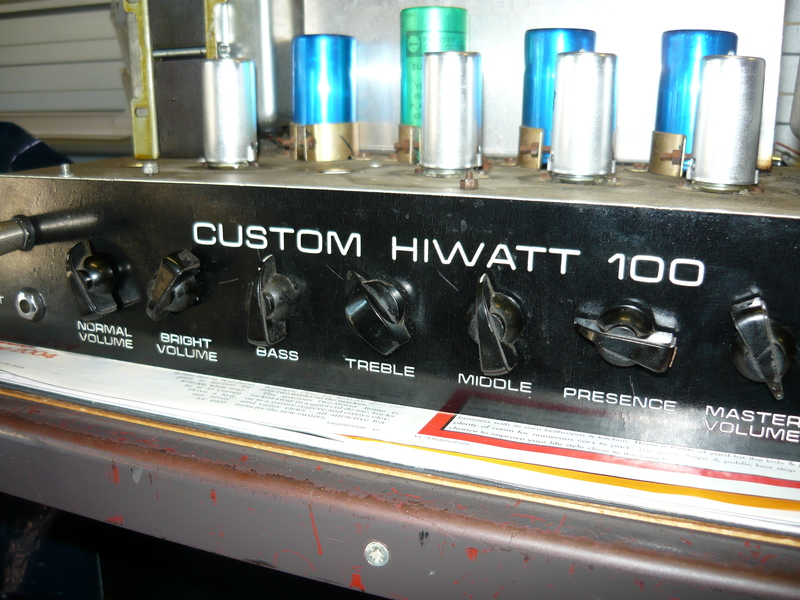 We are currently building several custom amps from 15 watts to 60 watts [to a customer order], that while not a carbon copy of the Hiwatt, are very strongly inspired by the Hiwatt and will deliver the classic British tonality at more sensible volumes. 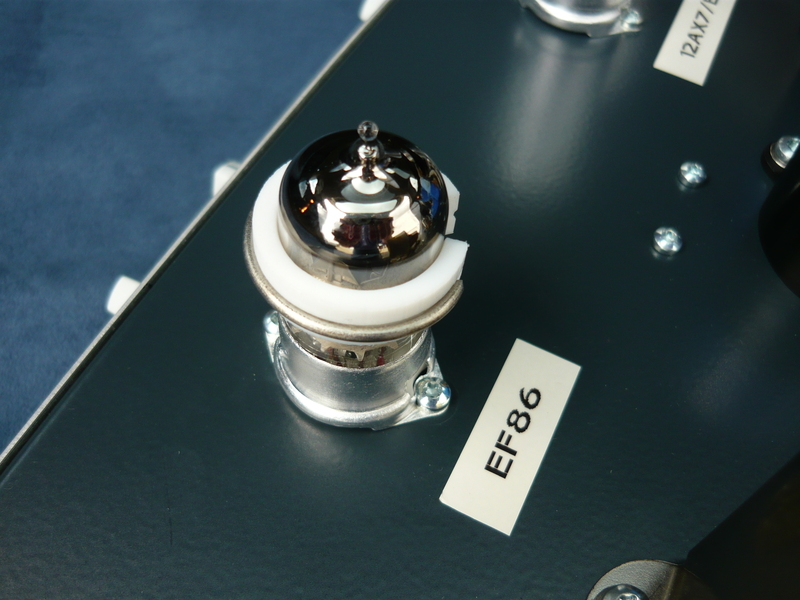 These amps are offered with a choice of EL34, KT66 or KT88 output valves. We also offer a single-ended KT88 model at 15 watts output. Thanks for checking in again, and there’s plenty more amp talk to come. IR. 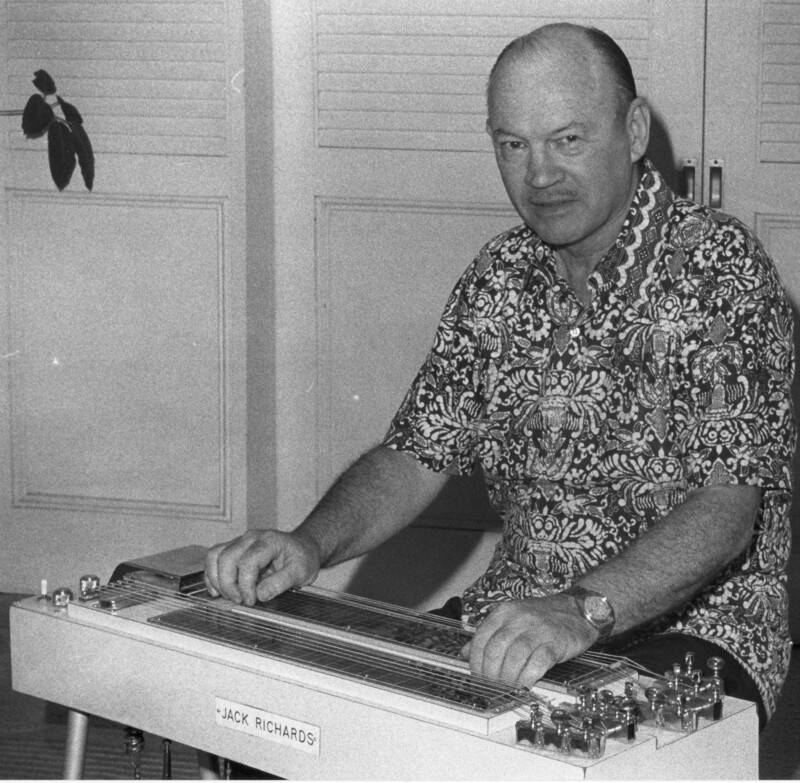 Jack Richards, without question the Godfather of Australian pedal steel guitar, passed away age 93 during the night Thursday 6th March 2014. Born 1921 in Sydney Australia, Jack also established himself as one of Sydney’s leading guitar professionals in the 1940’s & 1950’s, a contemporary of the top players of the time, including such names as Don Andrews, George Golla and Jan Gold. Jack purchased his first steel guitar in 1937 for $3. In 1939 he purchased a new Rickenbacker steel and amp for about $115. At this time (like many in the Richards family) Jack was employed in the newspaper business, working for the Sydney Sun initially as a copy boy straight from school, then as a press photographer, having completed an apprenticeship. Jack had a flair for photography, but had greater ambitions in the world of music, well beyond playing lap steel. With the engineering skills of another steel guitar enthusiast, Ivan Ive, the first pedal steel guitar in Australia was built in a suburban garage in Sydney (pictured at left). The steel and amplifier were combined in a single very impressive cabinet, with the initials JR part of the speaker grille. Jack evolved a new style of playing steel within a jazz and big band context together with a (then) young sax player, David Rutlege. 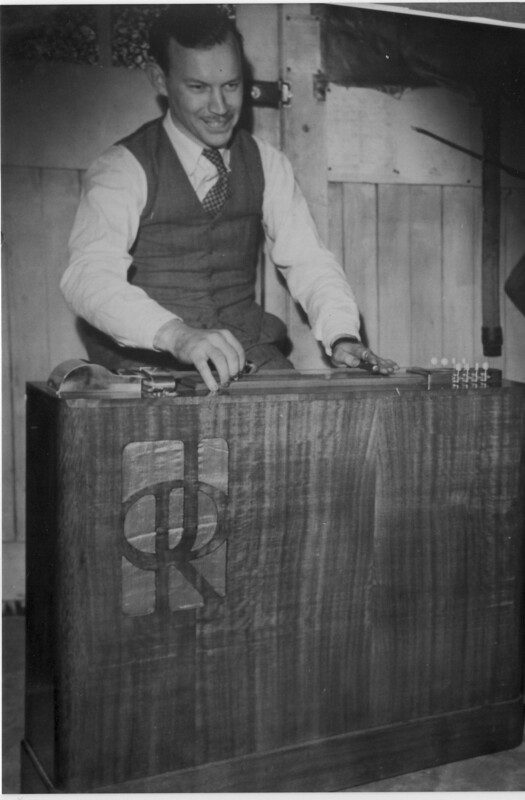 Jack became the first person to play pedal steel guitar in Australia at a professional gig, in 1943 at the ‘Roosevelt Club’, a club for American Officers in Sydney during WW2. In 1944, Jack was hired as pedal steel guitarist by bandleader Leo White for his 15 piece orchestra. In 1945, the same band landed a 6 nights per week 2 year residency at the very swank ‘Princes’ restaurant, at that time literally Sydney’s top nightclub/restaurant. During the WW2 years, Sydney’s nightlife and live music scene had ramped up considerably from the previous decade. In the Leo White bands, Jack also played conventional orchestral/big band style (archtop) guitar, becoming a proficient reader on both instruments. After the ‘Princes’ gig finished, there was a slow downturn in the live music scene after WW2, as might be expected. Jack stayed busy doing most of the studio sessions in Sydney on pedal steel, also including programmes on both ABC radio & TV. An example is the hawaiian music sessions with Sydney crooner Johnny Wade, who had his own weekly shows on the ABC. Jack also developed his arranging skills during this period. Radio & TV shows were generally broadcast “live” to air with all musicians required to read charts. Definitely no miming back in those days ! During 1947 – 1948 production of the ‘Kord King’ pedal steel guitar took place in a small factory in Cremorne (Sydney). 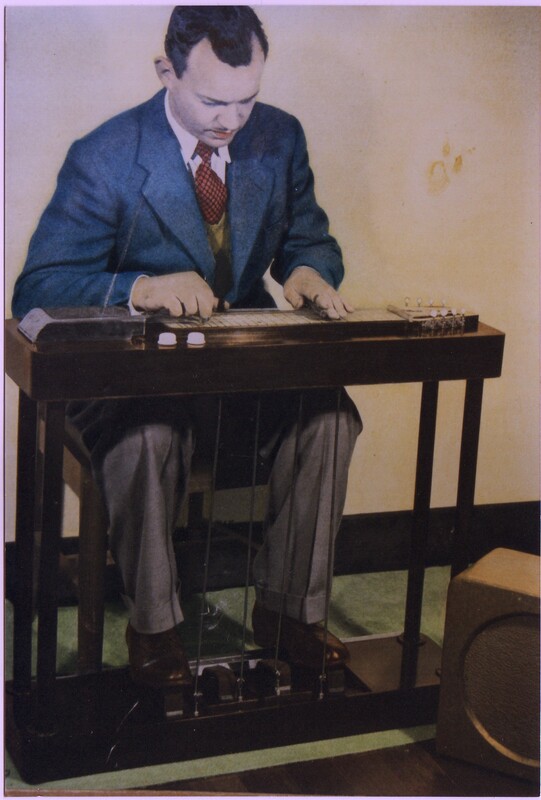 This was arguably the first production run of a pedal steel guitar in the world. The three main partners involved in this were Jack Richards, Ray Olson and Alec Iverson – all photographers and all steel players. My apologies for any errors and omissions in this story, there may have been others who contributed to this project. This time the pedal steel was not a huge console, but rather a portable instrument with a separate amplifier unit. 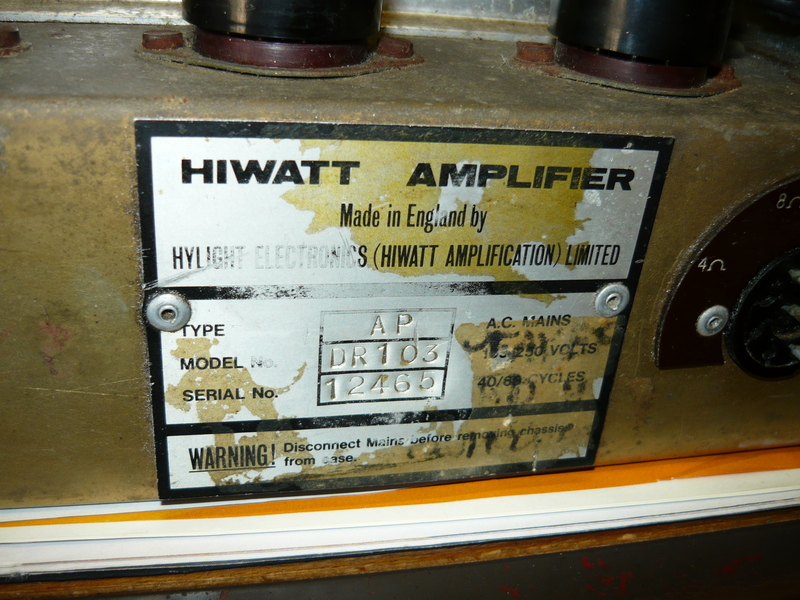 The amplifier was built in another factory in Cremorne, details not known. The initial production run was 100 units plus some lap steels. The boys thought they had it made – that they would conquer the world, but it was not to be. The widespread use of pedal steel guitar in country music was still a long way off. There were only a handful of guitarists with the sophistication to use Jack’s jazz approach to the steel, and interest in Hawaiian music would ultimately wane. In retrospect they were about 20 years too early. The Cremorne factory eventually moved to Ben Boyd Road, Neutral Bay, on a corner opposite The Oaks Hotel (then the watering hole for the large tram and bus depot right next door), producing cases for jewellery and cutlery, etc. At the time, we lived close by in Grosvenor Street. I don’t think this was a happy period in Jack’s life. After the business was wound up, Jack started ‘Guitar City’ with partner Roy Royston (plus a silent partner), primarily as a teaching studio, but was developed over time as a guitar and amplifier retailer as well. This was arguably Sydney’s first ‘specialist’ guitar shop. I can remember ‘Guitar City’ at three different locations in the Sydney CBD: Railway Square, Telford House and the Gibb & Beeman Building – the latter two both prime George Street locations. I believe that the original teaching studio was in Kirribilli/North Sydney, but have no personal memory of that. The business prospered during the 60’s explosion of guitar ‘groups’, with Jack & Roy selling out to younger owners in the early 70’s. From this time onwards until his retirement from the music business at age 65, Jack continued teaching in the Manly area of Sydney, and held down numerous club and theatre/restaurant gigs around town. Jack is survived by three sons: Ivan, Trevor and Mark, one daughter: Karen, plus eight grandchildren and five great-grandchildren. Thank you Jack for passing on the gift of music to me !! Jack Richards demonstrates the Kord King, Sydney Australia. The Kord King was intended to be easy to transport to gigs. Steve Edmonds is a well established and much admired guitar player on the Australian music scene, based in the Sydney area. 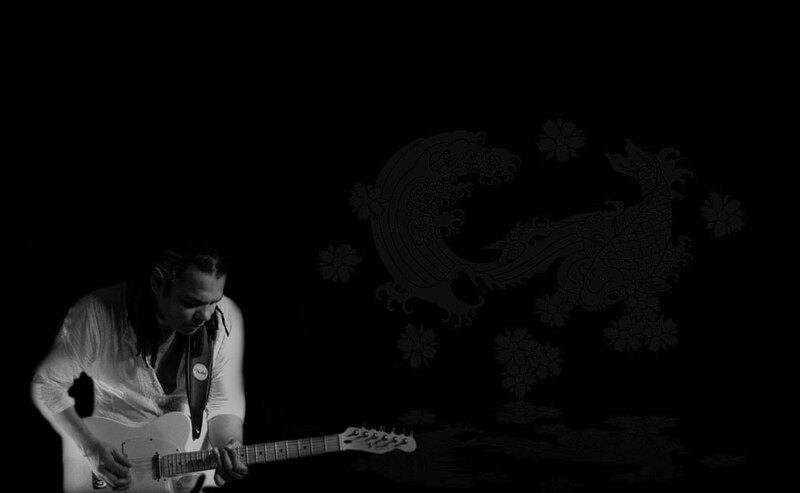 Steve has put a lot of hard work into carving out his own niche as a blues guitarist, a straight ahead rock guitarist, ie the Steve Edmonds Band, and is also well known for his Jimi Hendrix Tribute shows, eg Hendrix and Heroes. More recently, Steve has come up with a fresh concept and a new band by the name of Mescalero. With Esteban (Steve) on guitar/vocals, Antonio on drums and Alejandro on double-bass, Mescalero are described as a Roots Rock band, which incorporates Rockabilly, Surf, Western Swing, Bop, Big Band, Ska, Mambo and Country influences ! The new band is already gigging and recording. Which brings us to the subject matter of this blog – both Steve and Alex had amp mishaps last week which required immediate attention as there were gigs booked from Thursday night onwards. 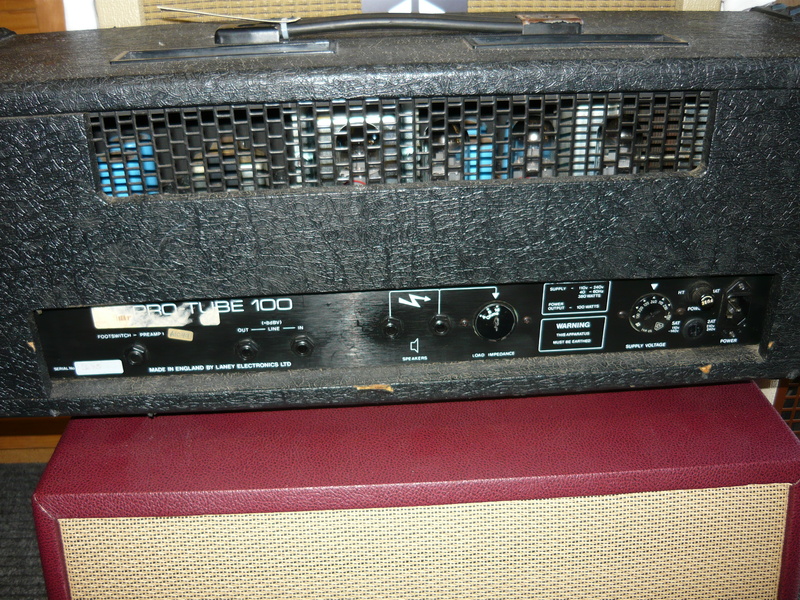 Firstly, there was Steve’s amp. 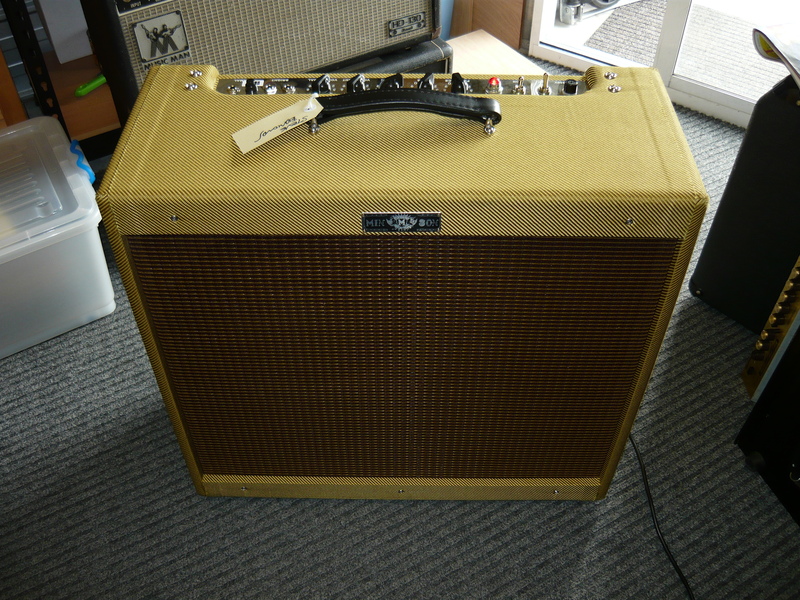 This is a replica of the ’57 Tweed Twin Amp, made in China, and distributed locally by Lawrie Minson in Tamworth, New South Wales. 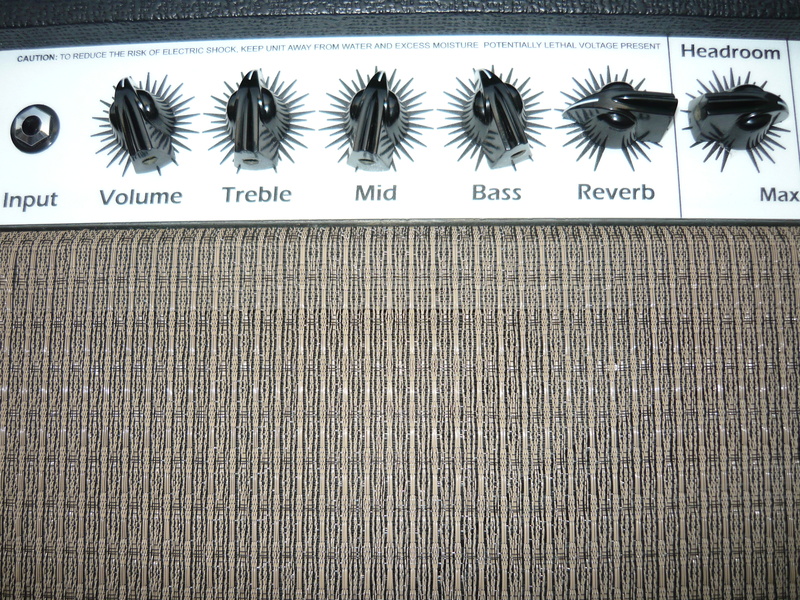 These are the models that famously (in the Fender line-up) introduced separate Treble and Bass controls, rather than a single Tone control (the addition of a Midrange control was still a year or two away), along with the Bandmaster, Super and Pro amp models (apologies to Fender enthusiasts if we’ve left out any details). Steve’s amp was repeatedly blowing the mains fuse – if this happens more than once clearly something is seriously wrong ! 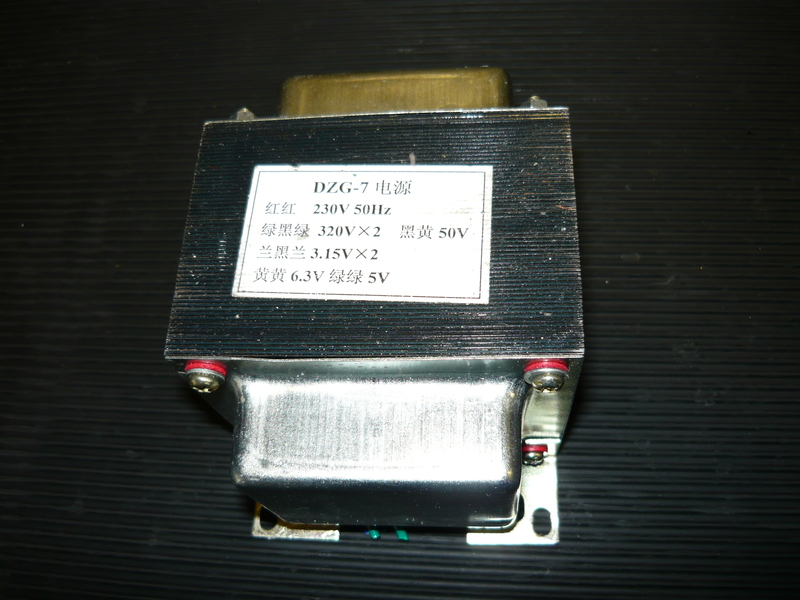 At first we all assumed that one or both of the 5U4 rectifier valves had developed a short-circuit (S/C). This is quite a reasonable assumption, but it was not to be that simple. We first plugged the amp into the mains via a ballast light, so that we didn’t have to keep replacing blown fuses while troubleshooting the problem. We removed all valves (tubes) from their sockets but the S/C was still there. Obviously the problem was in the power supply, and potentially the power transformer was the culprit. One by one we removed the transformer secondaries, so that each secondary was unloaded, and retested. Please don’t try this at home !! Finally, we had the primary connected directly the the active and neutral wires and we still apparently had a S/C in the power transformer. So, we emailed Lawrie Minson who sent us down a replacement transformer which we installed, along with a bit of tidying up of the 240V primary wiring. With all valves reinstalled and tidying up of the disturbed wiring with nylon cable ties, we could successfully test Steve’s amp for electrical safety and power output. Back in the day, even with a pair of 5U4 rectifiers, these amps only delivered around 30 watts rms, and this replica of course delivers similar performance. Steve actually requested slightly earlier break-up, so we installed a single 5U4 by Electro-Harmonix, our favourite sounding current production 5U4, which also has a good reputation for reliability. 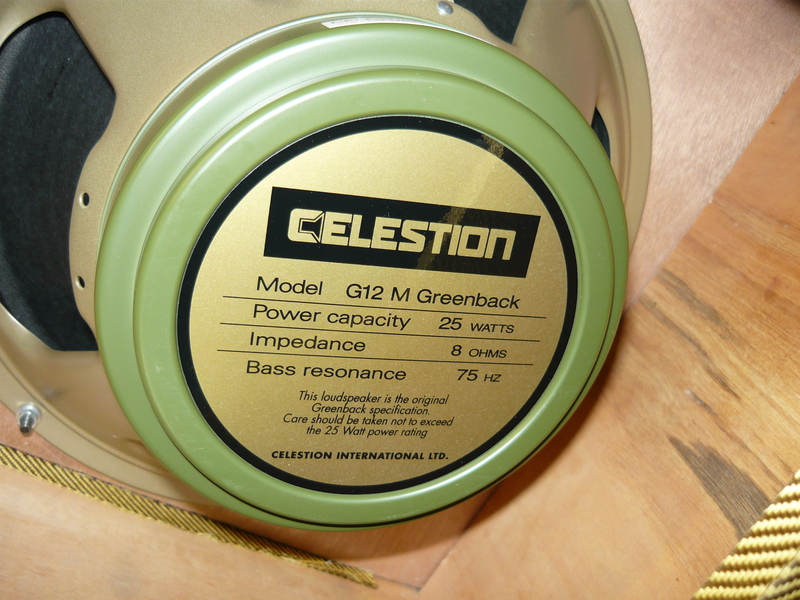 The factory loaded speakers with this amp were a pair of the budget model Celestion G12-65 (not the ‘Heritage’ model), which were letting the amp down quite noticeably. 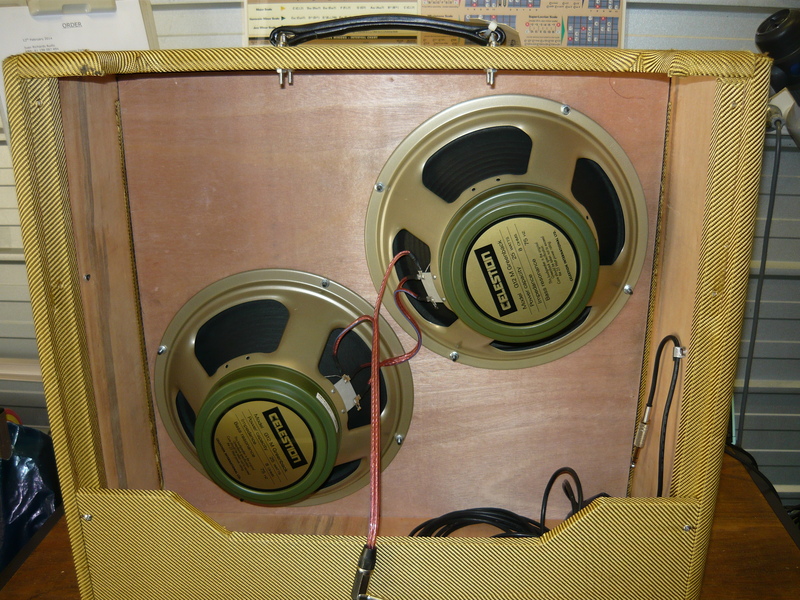 At Steve’s request we upgraded these to a pair of Celestion G12M25 ‘Greenback‘ speakers, at 8 ohms each, wired for the system impedance of 4 ohms. still one of the sweetest sounding guitar speakers ! This upgrade improved the tone and response of the amp 100 %. The woody, somewhat midrange-scooped tone of the Greenbacks balanced better with the flat midrange response (at most settings) of the ’57 Tweed Twin amp, and introduced a warmth and sweetness that wasn’t really there before. When Steve came to pick up the completed repair/upgrade he gave the amp a good workout with our Fender ’52 Tele Reissue loaded with the Pete Biltoft Vintage Vibe pickups (see blog NOV 24, 2013). Part-II of the story: Mescalero bass player Alex Campbell brought his amp to the workshop – a Hartke 500 watt bass amp head. A mishap when moving the bass rig caused a jack plug to break off inside a speaker jack on the back of the amp, and worse still the master volume control was smashed and unuseable. Aside from those two issues the amp appeared to be unharmed. 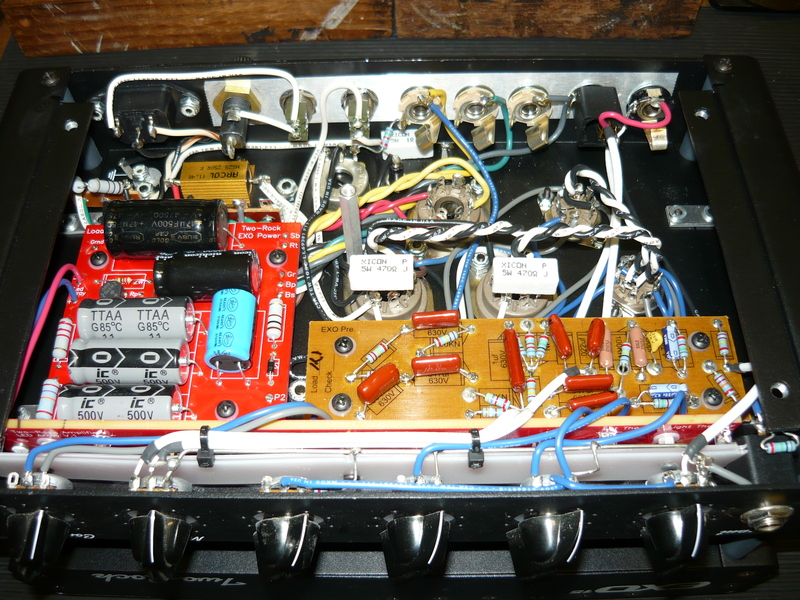 We removed the broken speaker plug from inside the amp, wired Alex a new heavy-duty jack-jack speaker cable, and stripped out the preamp/power supply PCB to replace the 10K Lin 16mm master volume pot. This involves unscrewing many, many screws and removing the front panel – the complete job takes about an hour. While we had the amp apart we cleaned up accumulated dust from the power amp’s forced air cooling system – an important little task to keep the amp running reliably. The design and assembly of the Hartke amp is completely conventional – there is no digital circuitry, no switching power supply. The amp is isolated from the 240V mains by a huge toroidal transformer. From the point of view of the service tech, this is a positive thing – the whole amp is accessible for ease of servicing. The only problems we’ve had with the Hartke amps over the years (with one or two exceptions) have been ‘dry’ solder joints and poor quality input jacks. 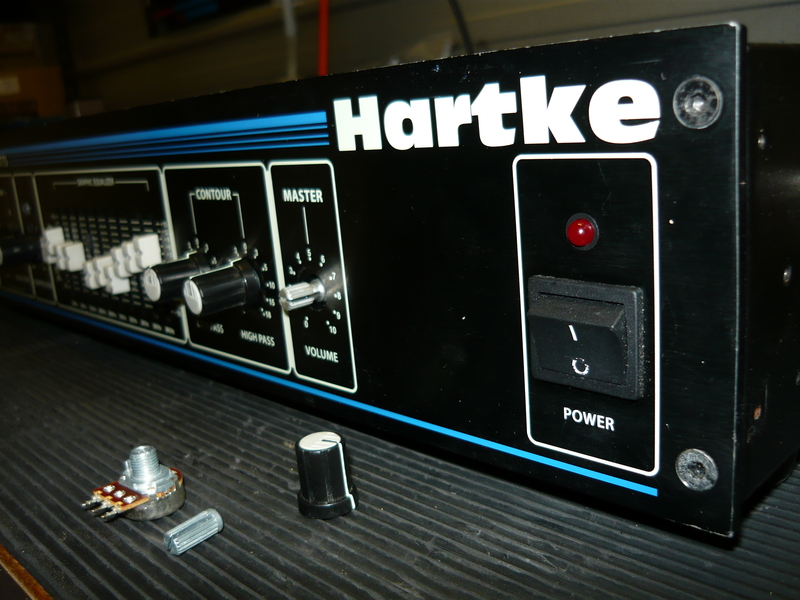 The Hartke does not have a ‘signature’ sound, but this is a matter of personal taste. Many thanks to Steve and Alex for their continued custom ! We wish Steve all the best for his new band – please check out Mescalero soon. 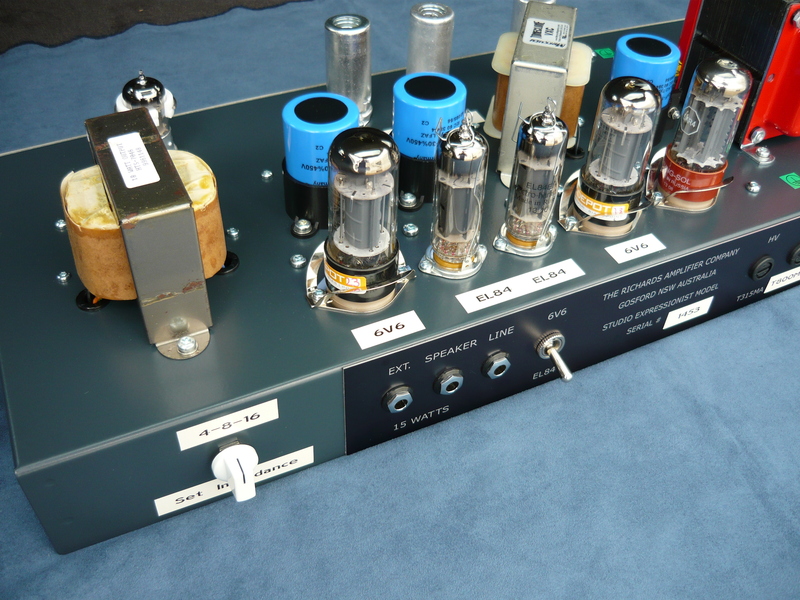 I have been servicing valve [tube] audio equipment now for over 30 years and have worked on most brands and models from the early 1960's to current production. 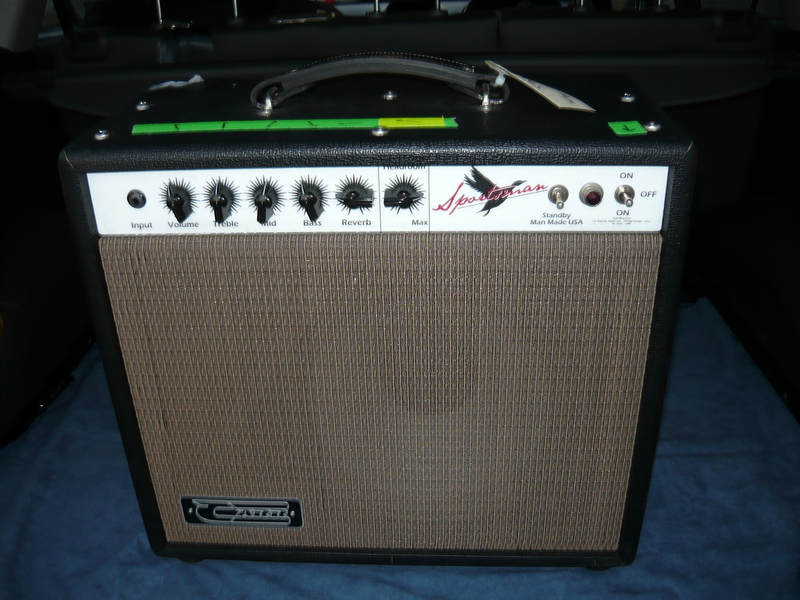 I can restore your amp to correct and original working order, removing unwanted modifications and correcting previous servicing mistakes and poor workmanship. Quality workmanship and components will always be my first priority,with a strong emphasis on electrical safety.